Buddhism is a nontheistic religion that encompasses a variety of traditions, beliefs and practices largely based on teachings attributed to Siddhartha Gautama, who is commonly known as the Buddha, meaning "the awakened one". According to Buddhist tradition, the Buddha lived and taught in the eastern part of the Indian subcontinent sometime between the 6th and 4th centuries BCE. 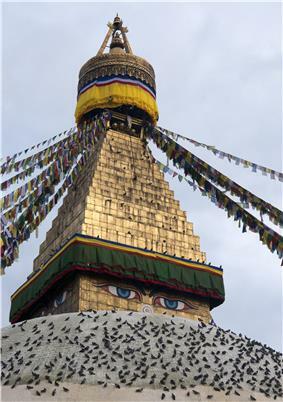 He is recognized by Buddhists as an awakened or enlightened teacher who shared his insights to help sentient beings end their suffering through the elimination of ignorance and craving by way of understanding and the seeing of dependent origination and the Four Noble Truths, with the ultimate goal of attainment of the sublime state of Nirvana, by practicing the Noble Eightfold Path (also known as the Middle Way). Two major extant branches of Buddhism are generally recognized: Theravada ("The School of the Elders") and Mahayana ("The Great Vehicle"). 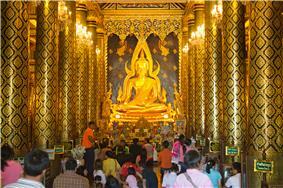 Theravada has a widespread following in Sri Lanka and Southeast Asia (Cambodia, Laos, Thailand, Myanmar etc.). Mahayana is found throughout East Asia (China, Korea, Japan, Vietnam, Singapore, Taiwan etc.) and includes the traditions of Pure Land, Zen, Nichiren Buddhism, Tibetan Buddhism, Shingon, and Tiantai (Tendai). In some classifications, Vajrayana—practiced mainly in Tibet and Mongolia, and adjacent parts of China and Russia—is recognized as a third branch, with a body of teachings attributed to Indian siddhas, while others classify it as a part of Mahayana. Buddhist schools vary on the exact nature of the path to liberation, the importance and canonicity of various teachings and scriptures, and especially their respective practices. One consistent belief held by all Buddhist schools is the lack of a Creator deity. The foundations of Buddhist tradition and practice are the Three Jewels: the Buddha, the Dharma (the teachings), and the Sangha (the community). Taking "refuge in the triple gem" has traditionally been a declaration and commitment to being on the Buddhist path, and in general distinguishes a Buddhist from a non-Buddhist. 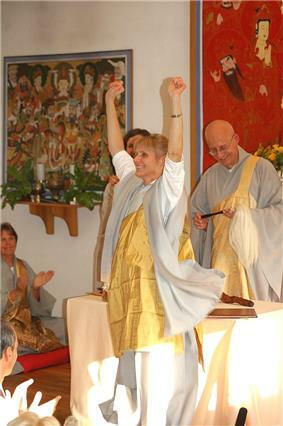 Other practices may include following ethical precepts; support of the monastic community; renouncing conventional living and becoming a monastic; the development of mindfulness and practice of meditation; cultivation of higher wisdom and discernment; study of scriptures; devotional practices; ceremonies; and in the Mahayana tradition, invocation of buddhas and bodhisattvas. This narrative draws on the Nidānakathā biography of the Theravāda sect in Sri Lanka, which is ascribed to Buddhaghoṣa in the 5th century CE. Earlier biographies such as the Buddhacarita, the Lokottaravādin Mahāvastu, and the Mahāyāna/ Sarvāstivāda Lalitavistara Sūtra, give different accounts. Scholars are hesitant to make unqualified claims about the historical facts of the Buddha's life. Most accept that he lived, taught and founded a monastic order, but do not consistently accept all of the details contained in his biographies. According to author Michael Carrithers, while there are good reasons to doubt the traditional account, "the outline of the life must be true: birth, maturity, renunciation, search, awakening and liberation, teaching, death." 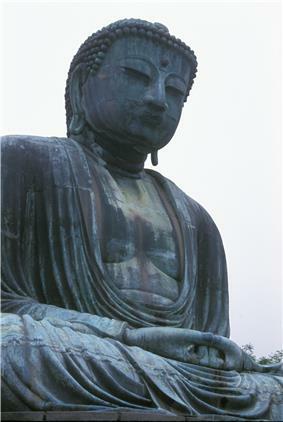 In writing her biography of the Buddha, Karen Armstrong noted, "It is obviously difficult, therefore, to write a biography of the Buddha that meets modern criteria, because we have very little information that can be considered historically sound... [but] we can be reasonably confident Siddhatta Gotama did indeed exist and that his disciples preserved the memory of his life and teachings as well as they could." 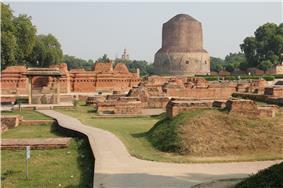 The evidence of the early texts suggests that Siddhārtha Gautama was born in a community that was on the periphery, both geographically and culturally, of the northeastern Indian subcontinent in the 5th century BCE. It was either a small republic, in which case his father was an elected chieftain, or an oligarchy, in which case his father was an oligarch. According to this narrative, shortly after the birth of young prince Gautama, an astrologer named Asita visited the young prince's father—King Śuddhodana—and prophesied that Siddhartha would either become a great king or renounce the material world to become a holy man, depending on whether he saw what life was like outside the palace walls. Śuddhodana was determined to see his son become a king, so he prevented him from leaving the palace grounds. But at age 29, despite his father's efforts, Gautama ventured beyond the palace several times. In a series of encounters—known in Buddhist literature as the four sights—he learned of the suffering of ordinary people, encountering an old man, a sick man, a corpse and, finally, an ascetic holy man, apparently content and at peace with the world. These experiences prompted Gautama to abandon royal life and take up a spiritual quest. Gautama first went to study with famous religious teachers of the day, and mastered the meditative attainments they taught. But he found that they did not provide a permanent end to suffering, so he continued his quest. He next attempted an extreme asceticism, which was a religious pursuit common among the Shramanas, a religious culture distinct from the Vedic one. Gautama underwent prolonged fasting, breath-holding, and exposure to pain. He almost starved himself to death in the process. He realized that he had taken this kind of practice to its limit, and had not put an end to suffering. So in a pivotal moment he accepted milk and rice from a village girl and changed his approach. He devoted himself to anapanasati meditation, through which he discovered what Buddhists call the Middle Way (Skt. madhyamā-pratipad): a path of moderation between the extremes of self-indulgence and self-mortification. Gautama was now determined to complete his spiritual quest. At the age of 35, he famously sat in meditation under a sacred fig tree — known as the Bodhi tree — in the town of Bodh Gaya, India, and vowed not to rise before achieving enlightenment. After many days, he finally destroyed the fetters of his mind, thereby liberating himself from the cycle of suffering and rebirth, and arose as a fully enlightened being (Skt. samyaksaṃbuddha). Soon thereafter, he attracted a band of followers and instituted a monastic order. 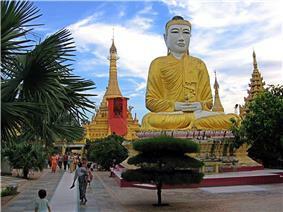 Now, as the Buddha, he spent the rest of his life teaching the path of awakening he had discovered, traveling throughout the northeastern part of the Indian subcontinent, and died at the age of 80 (483 BCE) in Kushinagar, India. The south branch of the original fig tree available only in Anuradhapura Sri Lanka is known as Jaya Sri Maha Bodhi. In Buddhism, Karma (from Sanskrit: "action, work") is the force that drives saṃsāra—the cycle of suffering and rebirth for each being. Good, skillful deeds (Pāli: "kusala") and bad, unskillful (Pāli: "akusala") actions produce "seeds" in the mind that come to fruition either in this life or in a subsequent rebirth. The avoidance of unwholesome actions and the cultivation of positive actions is called śīla (from Sanskrit: "ethical conduct"). In Buddhism, karma specifically refers to those actions of body, speech or mind that spring from mental intent ("cetana"), and bring about a consequence or fruit, (phala) or result (vipāka). In Theravada Buddhism there can be no divine salvation or forgiveness for one's karma, since it is a purely impersonal process that is a part of the makeup of the universe. In Mahayana Buddhism, the texts of certain Mahayana sutras (such as the Lotus Sutra, the Angulimaliya Sutra and the Nirvana Sutra) claim that the recitation or merely the hearing of their texts can expunge great swathes of negative karma. Some forms of Buddhism (for example, Vajrayana) regard the recitation of mantras as a means for cutting off of previous negative karma. The Japanese Pure Land teacher Genshin taught that Amida Buddha has the power to destroy the karma that would otherwise bind one in saṃsāra. Rebirth refers to a process whereby beings go through a succession of lifetimes as one of many possible forms of sentient life, each running from conception to death. Buddhism rejects the concepts of a permanent self or an unchanging, eternal soul, as it is called in Hinduism and Christianity. According to Buddhism there ultimately is no such thing as a self independent from the rest of the universe (the doctrine of anatta). Buddhists also refer to themselves as the believers of the anatta doctrine—Nairatmyavadin or Anattavadin. Rebirth in subsequent existences must be understood as the continuation of a dynamic, ever-changing process of "dependent arising" ("pratītyasamutpāda") determined by the laws of cause and effect (karma) rather than that of one being, transmigrating or incarnating from one existence to the next. Each rebirth takes place within one of five realms according to Theravadins, or six according to other schools. Devas including Brahmas: variously translated as gods, deities, spirits, angels, or left untranslated. The above are further subdivided into 31 planes of existence. Rebirths in some of the higher heavens, known as the Śuddhāvāsa Worlds or Pure Abodes, can be attained only by skilled Buddhist practitioners known as anāgāmis (non-returners). Rebirths in the arupa-dhatu (formless realms) can be attained by only those who can meditate on the arūpajhānas, the highest object of meditation. According to East Asian and Tibetan Buddhism, there is an intermediate state (Tibetan "Bardo") between one life and the next. The orthodox Theravada position rejects this; however there are passages in the Samyutta Nikaya of the Pali Canon (the collection of texts on which the Theravada tradition is based), that seem to lend support to the idea that the Buddha taught of an intermediate stage between one life and the next. The Buddha teaching the Four Noble Truths. Sanskrit manuscript. 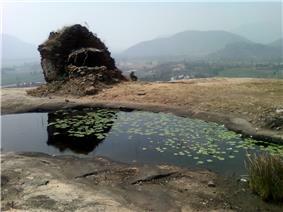 Nālandā, Bihar, India. The obvious suffering of physical and mental illness, growing old, and dying. The anxiety or stress of trying to hold onto things that are constantly changing. The Noble Eightfold Path—the fourth of the Buddha's Noble Truths—consists of a set of eight interconnected factors or conditions, that when developed together, lead to the cessation of dukkha. These eight factors are: Right View (or Right Understanding), Right Intention (or Right Thought), Right Speech, Right Action, Right Livelihood, Right Effort, Right Mindfulness, and Right Concentration. Ajahn Sucitto describes the path as "a mandala of interconnected factors that support and moderate each other." The eight factors of the path are not to be understood as stages, in which each stage is completed before moving on to the next. Rather, they are understood as eight significant dimensions of one's behaviour—mental, spoken, and bodily—that operate in dependence on one another; taken together, they define a complete path, or way of living. May all sentient beings be in equanimity, free of bias, attachment and anger. Another term for emptiness, the ultimate nature of all phenomena (in the Mahayana branch), a lack of inherent existence, which avoids the extremes of permanence and nihilism or inherent existence and nothingness. Buddhist scholars have produced a number of intellectual theories, philosophies and world view concepts (see, for example, Abhidharma, Buddhist philosophy and Reality in Buddhism). Some schools of Buddhism discourage doctrinal study, and some regard it as essential practice. The concept of liberation (nirvāṇa)—the goal of the Buddhist path—is closely related to overcoming ignorance (avidyā), a fundamental misunderstanding or mis-perception of the nature of reality. In awakening to the true nature of the self and all phenomena one develops dispassion for the objects of clinging, and is liberated from suffering (dukkha) and the cycle of incessant rebirths (saṃsāra). To this end, the Buddha recommended viewing things as characterized by the three marks of existence. The Three Marks of Existence are impermanence, suffering, and not-self. Impermanence (Pāli: anicca) expresses the Buddhist notion that all compounded or conditioned phenomena (all things and experiences) are inconstant, unsteady, and impermanent. Everything we can experience through our senses is made up of parts, and its existence is dependent on external conditions. Everything is in constant flux, and so conditions and the thing itself are constantly changing. Things are constantly coming into being, and ceasing to be. Since nothing lasts, there is no inherent or fixed nature to any object or experience. According to the doctrine of impermanence, life embodies this flux in the aging process, the cycle of rebirth (saṃsāra), and in any experience of loss. The doctrine asserts that because things are impermanent, attachment to them is futile and leads to suffering (dukkha). Suffering (Pāli: दुक्ख dukkha; Sanskrit दुःख duḥkha) is also a central concept in Buddhism. The word roughly corresponds to a number of terms in English including suffering, pain, unsatisfactoriness, sorrow, affliction, anxiety, dissatisfaction, discomfort, anguish, stress, misery, and frustration. Although the term is often translated as "suffering", its philosophical meaning is more analogous to "disquietude" as in the condition of being disturbed. As such, "suffering" is too narrow a translation with "negative emotional connotations" that can give the impression that the Buddhist view is pessimistic, but Buddhism seeks to be neither pessimistic nor optimistic, but realistic. In English-language Buddhist literature translated from Pāli, "dukkha" is often left untranslated, so as to encompass its full range of meaning. Not-self (Pāli: anatta; Sanskrit: anātman) is the third mark of existence. Upon careful examination, one finds that no phenomenon is really "I" or "mine"; these concepts are in fact constructed by the mind. In the Nikayas anatta is not meant as a metaphysical assertion, but as an approach for gaining release from suffering. In fact, the Buddha rejected both of the metaphysical assertions "I have a Self" and "I have no Self" as ontological views that bind one to suffering. When asked if the self was identical with the body, the Buddha refused to answer. By analyzing the constantly changing physical and mental constituents (skandhas) of a person or object, the practitioner comes to the conclusion that neither the respective parts nor the person as a whole comprise a self. The doctrine of pratītyasamutpāda, (Sanskrit; Pali: paticcasamuppāda; Tibetan: rten.cing.'brel.bar. 'byung.ba; Chinese: 緣起) is an important part of Buddhist metaphysics. It states that phenomena arise together in a mutually interdependent web of cause and effect. It is variously rendered into English as "dependent origination", "conditioned genesis", "dependent co-arising", "interdependent arising", or "contingency". Jarāmaraṇa: (old age and death) and also soka, parideva, dukkha, domanassa and upāyāsā (sorrow, lamentation, pain, affliction and despair). Sentient beings always suffer throughout saṃsāra, until they free themselves from this suffering (dukkha) by attaining Nirvana. Then the absence of the first Nidāna—ignorance—leads to the absence of the others. Mahayana Buddhism received significant theoretical grounding from Nagarjuna (perhaps c. 150–250 CE), arguably the most influential scholar within the Mahayana tradition. Nagarjuna's primary contribution to Buddhist philosophy was the systematic exposition of the concept of śūnyatā, or "emptiness", widely attested in the Prajñāpāramitā sutras that emerged in his era. The concept of emptiness brings together other key Buddhist doctrines, particularly anatta and dependent origination, to refute the metaphysics of Sarvastivada and Sautrantika (extinct non-Mahayana schools). For Nagarjuna, it is not merely sentient beings that are empty of ātman; all phenomena (dharmas) are without any svabhava (literally "own-nature" or "self-nature"), and thus without any underlying essence; they are "empty" of being independent; thus the heterodox theories of svabhava circulating at the time were refuted on the basis of the doctrines of early Buddhism. Nagarjuna's school of thought is known as the Mādhyamaka. Some of the writings attributed to Nagarjuna made explicit references to Mahayana texts, but his philosophy was argued within the parameters set out by the agamas. He may have arrived at his positions from a desire to achieve a consistent exegesis of the Buddha's doctrine as recorded in the Canon. In the eyes of Nagarjuna the Buddha was not merely a forerunner, but the very founder of the Mādhyamaka system. Sarvastivada teachings—which were criticized by Nāgārjuna—were reformulated by scholars such as Vasubandhu and Asanga and were adapted into the Yogacara (Sanskrit: yoga practice) school. While the Mādhyamaka school held that asserting the existence or non-existence of any ultimately real thing was inappropriate, some exponents of Yogacara asserted that the mind and only the mind is ultimately real (a doctrine known as cittamatra). Not all Yogacarins asserted that mind was truly existent; Vasubandhu and Asanga in particular did not. These two schools of thought, in opposition or synthesis, form the basis of subsequent Mahayana metaphysics in the Indo-Tibetan tradition. Besides emptiness, Mahayana schools often place emphasis on the notions of perfected spiritual insight (prajñāpāramitā) and Buddha-nature (tathāgatagarbha). There are conflicting interpretations of the tathāgatagarbha in Mahāyāna thought. The idea may be traced to Abhidharma, and ultimately to statements of the Buddha in the Nikāyas. In Tibetan Buddhism, according to the Sakya school, tathāgatagarbha is the inseparability of the clarity and emptiness of one's mind. In Nyingma, tathāgatagarbha also generally refers to inseparability of the clarity and emptiness of one's mind. According to the Gelug school, it is the potential for sentient beings to awaken since they are empty (i.e. dependently originated). According to the Jonang school, it refers to the innate qualities of the mind that expresses themselves as omniscience etc. when adventitious obscurations are removed. The "Tathāgatagarbha Sutras" are a collection of Mahayana sutras that present a unique model of Buddha-nature. Even though this collection was generally ignored in India, East Asian Buddhism provides some significance to these texts. Nirvana (Sanskrit; Pali: "Nibbana") means "cessation", "extinction" (of craving and ignorance and therefore suffering and the cycle of involuntary rebirths (saṃsāra)), "extinguished", "quieted", "calmed"; it is also known as "Awakening" or "Enlightenment" in the West. The term for anybody who has achieved nirvana, including the Buddha, is arahant. An important development in the Mahayana [was] that it came to separate nirvana from bodhi ('awakening' to the truth, Enlightenment), and to put a lower value on the former (Gombrich, 1992d). Originally nirvana and bodhi refer to the same thing; they merely use different metaphors for the experience. But the Mahayana tradition separated them and considered that nirvana referred only to the extinction of craving (passion and hatred), with the resultant escape from the cycle of rebirth. This interpretation ignores the third fire, delusion: the extinction of delusion is of course in the early texts identical with what can be positively expressed as gnosis, Enlightenment. Therefore, according to Mahayana Buddhism, the arahant has attained only nirvana, thus still being subject to delusion, while the bodhisattva not only achieves nirvana but full liberation from delusion as well. He thus attains bodhi and becomes a buddha. In Theravada Buddhism, bodhi and nirvana carry the same meaning as in the early texts, that of being freed from greed, hate and delusion. The term parinirvana is also encountered in Buddhism, and this generally refers to the complete nirvana attained by the arahant at the moment of death, when the physical body expires. According to Buddhist traditions a Buddha is a fully awakened being who has completely purified his mind of the three poisons of desire, aversion and ignorance. A Buddha is no longer bound by Samsara and has ended the suffering which unawakened people experience in life. Buddhists do not consider Siddhartha Gautama to have been the only Buddha. The Pali Canon refers to many previous ones (see List of the 28 Buddhas), while the Mahayana tradition additionally has many Buddhas of celestial, rather than historical, origin (see Amitabha or Vairocana as examples, for lists of many thousands Buddha names see Taishō Shinshū Daizōkyō numbers 439–448). 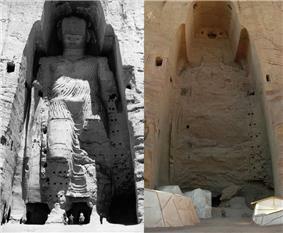 A common Theravada and Mahayana Buddhist belief is that the next Buddha will be one named Maitreya (Pali: Metteyya). Bodhi and nirvana carry the same meaning, that of being freed from craving, hate, and delusion. In attaining bodhi, the arahant has overcome these obstacles. As a further distinction, the extinction of only hatred and greed (in the sensory context) with some residue of delusion, is called anagami. In the Mahayana, the Buddha tends not to be viewed as merely human, but as the earthly projection of a beginningless and endless, omnipresent being (see Dharmakaya) beyond the range and reach of thought. Moreover, in certain Mahayana sutras, the Buddha, Dharma and Sangha are viewed essentially as One: all three are seen as the eternal Buddha himself. The Buddha's death is seen as an illusion, he is living on in other planes of existence, and monks are therefore permitted to offer "new truths" based on his input. Mahayana also differs from Theravada in its concept of śūnyatā (that ultimately nothing has existence), and in its belief in bodhisattvas (enlightened people who vow to continue being reborn until all beings can be enlightened). Celestial Buddhas are individuals who no longer exist on the material plane of existence, but who still aid in the enlightenment of all beings. Nirvana came to refer only to the extinction of greed and hate, implying that delusion was still present in one who attained Nirvana. Bodhi became a higher attainment that eradicates delusion entirely. Thus, the Arahant attains Nirvana but not Bodhi, thus still being subject to delusion, while the Buddha attains Bodhi. The method of self-exertion or "self-power"—without reliance on an external force or being—stands in contrast to another major form of Buddhism, Pure Land, which is characterised by utmost trust in the salvific "other-power" of Amitabha Buddha. Pure Land Buddhism is a very widespread and perhaps the most faith-orientated manifestation of Buddhism and centres upon the conviction that faith in Amitabha Buddha and the chanting of homage to his name liberates one at death into the Blissful (安樂), Pure Land (淨土) of Amitabha Buddha. This Buddhic realm is variously construed as a foretaste of Nirvana, or as essentially Nirvana itself. The great vow of Amitabha Buddha to rescue all beings from samsaric suffering is viewed within Pure Land Buddhism as universally efficacious, if only one has faith in the power of that vow or chants his name. Buddhists believe Gautama Buddha was the first to achieve enlightenment in this Buddha era and is therefore credited with the establishment of Buddhism. A Buddha era is the stretch of history during which people remember and practice the teachings of the earliest known Buddha. This Buddha era will end when all the knowledge, evidence and teachings of Gautama Buddha have vanished. 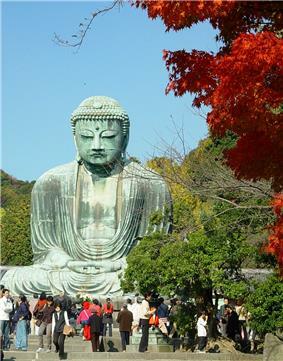 This belief therefore maintains that many Buddha eras have started and ended throughout the course of human existence. The Gautama Buddha, then, is the Buddha of this era, who taught directly or indirectly to all other Buddhas in it (see types of Buddhas). In addition, Mahayana Buddhists believe there are innumerable other Buddhas in other universes. A Theravada commentary says that Buddhas arise one at a time in this world element, and not at all in others. The understandings of this matter reflect widely differing interpretations of basic terms, such as "world realm", between the various schools of Buddhism. The idea of the decline and gradual disappearance of the teaching has been influential in East Asian Buddhism. Pure Land Buddhism holds that it has declined to the point where few are capable of following the path, so it may be best to rely on the power of the Amitabha Buddha. Bodhisattva means "enlightenment being", and generally refers to one who is on the path to buddhahood. Traditionally, a bodhisattva is anyone who, motivated by great compassion, has generated bodhicitta, which is a spontaneous wish to attain Buddhahood for the benefit of all sentient beings. Theravada Buddhism primarily uses the term in relation to Gautama Buddha's previous existences, but has traditionally acknowledged and respected the bodhisattva path as well. Because he has enlightenment as his aim, a bodhisattva-mahāsattva is so called. Mahāyāna Buddhism encourages everyone to become bodhisattvas and to take the bodhisattva vows. With these vows, one makes the promise to work for the complete enlightenment of all beings by practicing six perfections (Skt. pāramitā). According to the Mahāyāna teachings, these perfections are: giving, discipline, forbearance, effort, meditation, and transcendent wisdom. For as long as space endures, and for as long as living beings remain, until then may I too abide to dispel the misery of the world. Devotion is an important part of the practice of most Buddhists. Devotional practices include bowing, offerings, pilgrimage, and chanting. In Pure Land Buddhism, devotion to the Buddha Amitabha is the main practice. In Nichiren Buddhism, devotion to the Lotus Sutra is the main practice. 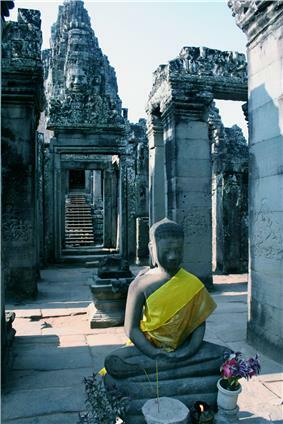 Buddhism traditionally incorporates states of meditative absorption (Pali: jhāna; Skt: dhyāna). The most ancient sustained expression of yogic ideas is found in the early sermons of the Buddha. One key innovative teaching of the Buddha was that meditative absorption must be combined with liberating cognition. The difference between the Buddha's teaching and the yoga presented in early Brahminic texts is striking. Meditative states alone are not an end, for according to the Buddha, even the highest meditative state is not liberating. Instead of attaining a complete cessation of thought, some sort of mental activity must take place: a liberating cognition, based on the practice of mindful awareness. Meditation was an aspect of the practice of the yogis in the centuries preceding the Buddha. The Buddha built upon the yogis' concern with introspection and developed their meditative techniques, but rejected their theories of liberation. In Buddhism, mindfulness and clear awareness are to be developed at all times; in pre-Buddhist yogic practices there is no such injunction. A yogi in the Brahmanical tradition is not to practice while defecating, for example, while a Buddhist monastic should do so. Religious knowledge or "vision" was indicated as a result of practice both within and outside of the Buddhist fold. According to the Samaññaphala Sutta, this sort of vision arose for the Buddhist adept as a result of the perfection of "meditation" coupled with the perfection of "discipline" (Pali sīla; Skt. śīla). 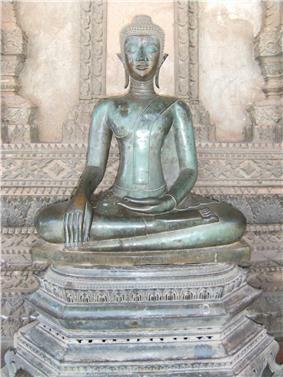 Some of the Buddha's meditative techniques were shared with other traditions of his day, but the idea that ethics are causally related to the attainment of "transcendent wisdom" (Pali paññā; Skt. prajñā) was original. The Buddhist texts are probably the earliest describing meditation techniques. They describe meditative practices and states that existed before the Buddha as well as those first developed within Buddhism. Two Upanishads written after the rise of Buddhism do contain full-fledged descriptions of yoga as a means to liberation. 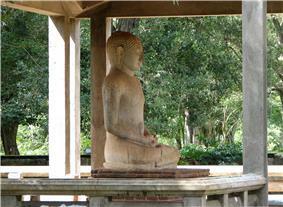 While there is no convincing evidence for meditation in pre-Buddhist early Brahminic texts, Wynne argues that formless meditation originated in the Brahminic or Shramanic tradition, based on strong parallels between Upanishadic cosmological statements and the meditative goals of the two teachers of the Buddha as recorded in the early Buddhist texts. He mentions less likely possibilities as well. Having argued that the cosmological statements in the Upanishads also reflect a contemplative tradition, he argues that the Nasadiya Sukta contains evidence for a contemplative tradition, even as early as the late Rig Vedic period. 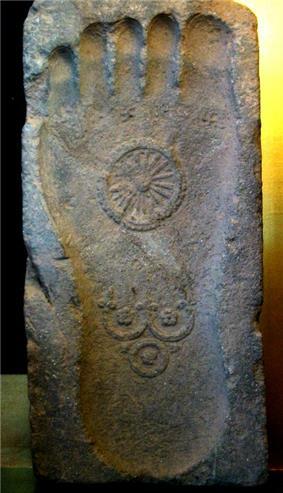 Relic depicting footprint of the Buddha with Dharmachakra and triratna, 1st century CE, Gandhāra. Traditionally, the first step in most Buddhist schools requires taking refuge in the Three Jewels (Sanskrit: tri-ratna, Pāli: ti-ratana) as the foundation of one's religious practice. The practice of taking refuge on behalf of young or even unborn children is mentioned in the Majjhima Nikaya, recognized by most scholars as an early text (cf. Infant baptism). Tibetan Buddhism sometimes adds a fourth refuge, in the lama. In Mahayana, the person who chooses the bodhisattva path makes a vow or pledge, considered the ultimate expression of compassion. In Mahayana, too, the Three Jewels are perceived as possessed of an eternal and unchanging essence and as having an irreversible effect: "The Three Jewels have the quality of excellence. Just as real jewels never change their faculty and goodness, whether praised or reviled, so are the Three Jewels (Refuges), because they have an eternal and immutable essence. These Three Jewels bring a fruition that is changeless, for once one has reached Buddhahood, there is no possibility of falling back to suffering." The Buddha. This is a title for those who have attained Nirvana. See also the Tathāgata and Gautama Buddha. The Buddha could also be represented as a concept instead of a specific person: the perfect wisdom that understands Dharma and sees reality in its true form. In Mahayana Buddhism, the Buddha can be viewed as the supreme Refuge: "Buddha is the Unique Absolute Refuge. Buddha is the Imperishable, Eternal, Indestructible and Absolute Refuge." The Dharma. The teachings or law of nature as expounded by the Gautama Buddha. It can also, especially in Mahayana, connote the ultimate and sustaining Reality that is inseparable from the Buddha. Further, from some Mahayana perspectives, the Dharma embodied in the form of a great sutra (Buddhic scripture) can replace the need for a personal teacher and can be a direct and spontaneous gateway into Truth (Dharma). This is especially said to be the case with the Lotus Sutra. Dr. Hiroshi Kanno writes of this view of the Lotus Sutra: "it is a Dharma-gate of sudden enlightenment proper to the Great Vehicle; it is a Dharma-gate whereby one awakens spontaneously, without resorting to a teacher". The Sangha. Those who have attained any of the Four stages of enlightenment, or simply the congregation of monastic practitioners. 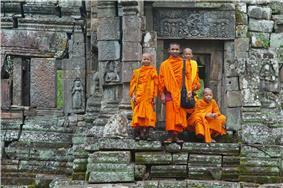 The monks' order, which began during the lifetime of the Buddha, is among the oldest organizations on Earth. According to the scriptures, Gautama Buddha presented himself as a model. The Dharma offers a refuge by providing guidelines for the alleviation of suffering and the attainment of Nirvana. The Sangha is considered to provide a refuge by preserving the authentic teachings of the Buddha and providing further examples that the truth of the Buddha's teachings is attainable. Śīla (Sanskrit) or sīla (Pāli) is usually translated into English as "virtuous behavior", "morality", "ethics" or "precept". It is an action committed through the body, speech, or mind, and involves an intentional effort. It is one of the three practices (sila, samadhi, and panya) and the second pāramitā. It refers to moral purity of thought, word, and deed. The four conditions of śīla are chastity, calmness, quiet, and extinguishment. Śīla is the foundation of Samadhi/Bhāvana (Meditative cultivation) or mind cultivation. Keeping the precepts promotes not only the peace of mind of the cultivator, which is internal, but also peace in the community, which is external. According to the Law of Karma, keeping the precepts are meritorious and it acts as causes that would bring about peaceful and happy effects. Keeping these precepts keeps the cultivator from rebirth in the four woeful realms of existence. Śīla refers to overall principles of ethical behavior. There are several levels of sila, which correspond to "basic morality" (five precepts), "basic morality with asceticism" (eight precepts), "novice monkhood" (ten precepts) and "monkhood" (Vinaya or Patimokkha). Lay people generally undertake to live by the five precepts, which are common to all Buddhist schools. If they wish, they can choose to undertake the eight precepts, which add basic asceticism. To refrain from intoxicants which lead to loss of mindfulness (specifically, drugs and alcohol). The precepts are not formulated as imperatives, but as training rules that laypeople undertake voluntarily to facilitate practice. In Buddhist thought, the cultivation of dana and ethical conduct themselves refine consciousness to such a level that rebirth in one of the lower heavens is likely, even if there is no further Buddhist practice. There is nothing improper or un-Buddhist about limiting one's aims to this level of attainment. 8. To refrain from using high or luxurious seats and bedding. Vinaya is the specific moral code for monks and nuns. It includes the Patimokkha, a set of 227 rules for monks in the Theravadin recension. The precise content of the vinayapitaka (scriptures on Vinaya) differs slightly according to different schools, and different schools or subschools set different standards for the degree of adherence to Vinaya. Novice-monks use the ten precepts, which are the basic precepts for monastics. Regarding the monastic rules, the Buddha constantly reminds his hearers that it is the spirit that counts. On the other hand, the rules themselves are designed to assure a satisfying life, and provide a perfect springboard for the higher attainments. Monastics are instructed by the Buddha to live as "islands unto themselves". In this sense, living life as the vinaya prescribes it is, as one scholar puts it: "more than merely a means to an end: it is very nearly the end in itself." In Eastern Buddhism, there is also a distinctive Vinaya and ethics contained within the Mahayana Brahmajala Sutra (not to be confused with the Pali text of that name) for Bodhisattvas, where, for example, the eating of meat is frowned upon and vegetarianism is actively encouraged (see vegetarianism in Buddhism). In Japan, this has almost completely displaced the monastic vinaya, and allows clergy to marry. In the language of the Noble Eightfold Path, samyaksamādhi is "right concentration". The primary means of cultivating samādhi is meditation. Upon development of samādhi, one's mind becomes purified of defilement, calm, tranquil, and luminous. Once the meditator achieves a strong and powerful concentration (jhāna, Sanskrit ध्यान dhyāna), his mind is ready to penetrate and gain insight (vipassanā) into the ultimate nature of reality, eventually obtaining release from all suffering. The cultivation of mindfulness is essential to mental concentration, which is needed to achieve insight. Samatha meditation starts from being mindful of an object or idea, which is expanded to one's body, mind and entire surroundings, leading to a state of total concentration and tranquility (jhāna) There are many variations in the style of meditation, from sitting cross-legged or kneeling to chanting or walking. The most common method of meditation is to concentrate on one's breath (anapanasati), because this practice can lead to both samatha and vipassana'. In Buddhist practice, it is said that while samatha meditation can calm the mind, only vipassanā meditation can reveal how the mind was disturbed to start with, which is what leads to insight knowledge (jñāna; Pāli ñāṇa) and understanding (prajñā Pāli paññā), and thus can lead to nirvāṇa (Pāli nibbāna). When one is in jhana, all defilements are suppressed temporarily. Only understanding (prajñā or vipassana) eradicates the defilements completely. Jhanas are also states that Arahants abide in order to rest. In Theravāda Buddhism, the cause of human existence and suffering is identified as craving, which carries with it the various defilements. These various defilements are traditionally summed up as greed, hatred and delusion. These are believed deeply rooted afflictions of the mind that create suffering and stress. To be free from suffering and stress, these defilements must be permanently uprooted through internal investigation, analyzing, experiencing, and understanding of the true nature of those defilements by using jhāna, a technique of the Noble Eightfold Path. It then leads the meditator to realize the Four Noble Truths, Enlightenment and Nibbana. Nibbana is the ultimate goal of Theravadins. Prajñā (Sanskrit) or paññā (Pāli) means wisdom that is based on a realization of dependent origination, The Four Noble Truths and the three marks of existence. Prajñā is the wisdom that is able to extinguish afflictions and bring about bodhi. It is spoken of as the principal means of attaining nirvāṇa, through its revelation of the true nature of all things as dukkha (unsatisfactoriness), anicca (impermanence) and anatta (not-self). Prajñā is also listed as the sixth of the six pāramitās of the Mahayana. Initially, prajñā is attained at a conceptual level by means of listening to sermons (dharma talks), reading, studying, and sometimes reciting Buddhist texts and engaging in discourse. Once the conceptual understanding is attained, it is applied to daily life so that each Buddhist can verify the truth of the Buddha's teaching at a practical level. Notably, one could in theory attain Nirvana at any point of practice, whether deep in meditation, listening to a sermon, conducting the business of one's daily life, or any other activity. Zen Buddhism (禅), pronounced Chán in Chinese, seon in Korean or zen in Japanese (derived from the Sanskrit term dhyāna, meaning "meditation") is a form of Buddhism that became popular in China, Korea and Japan and that lays special emphasis on meditation. [note 10] Zen places less emphasis on scriptures than some other forms of Buddhism and prefers to focus on direct spiritual breakthroughs to truth. Zen Buddhism is divided into two main schools: Rinzai (臨済宗) and Sōtō (曹洞宗), the former greatly favouring the use in meditation on the koan (公案, a meditative riddle or puzzle) as a device for spiritual break-through, and the latter (while certainly employing koans) focusing more on shikantaza or "just sitting". Zen Buddhist teaching is often full of paradox, in order to loosen the grip of the ego and to facilitate the penetration into the realm of the True Self or Formless Self, which is equated with the Buddha himself. According to Zen master Kosho Uchiyama, when thoughts and fixation on the little "I" are transcended, an Awakening to a universal, non-dual Self occurs: "When we let go of thoughts and wake up to the reality of life that is working beyond them, we discover the Self that is living universal non-dual life (before the separation into two) that pervades all living creatures and all existence." Thinking and thought must therefore not be allowed to confine and bind one. Though based upon Mahayana, Tibeto-Mongolian Buddhism is one of the schools that practice Vajrayana or "Diamond Vehicle" (also referred to as Mantrayāna, Tantrayāna, Tantric Buddhism, or esoteric Buddhism). It accepts all the basic concepts of Mahāyāna, but also includes a vast array of spiritual and physical techniques designed to enhance Buddhist practice. Tantric Buddhism is largely concerned with ritual and meditative practices. One component of the Vajrayāna is harnessing psycho-physical energy through ritual, visualization, physical exercises, and meditation as a means of developing the mind. Using these techniques, it is claimed that a practitioner can achieve Buddhahood in one lifetime, or even as little as three years. In the Tibetan tradition, these practices can include sexual yoga, though only for some very advanced practitioners. Historically, the roots of Buddhism lie in the religious thought of ancient India during the second half of the first millennium BCE. That was a period of social and religious turmoil, as there was significant discontent with the sacrifices and rituals of Vedic Brahmanism. It was challenged by numerous new ascetic religious and philosophical groups and teachings that broke with the Brahmanic tradition and rejected the authority of the Vedas and the Brahmans. These groups, whose members were known as shramanas, were a continuation of a non-Vedic strand of Indian thought distinct from Indo-Aryan Brahmanism. Scholars have reasons to believe that ideas such as samsara, karma (in the sense of the influence of morality on rebirth), and moksha originated in the shramanas, and were later adopted by Brahmin orthodoxy. This view is supported by a study of the region where these notions originated. Buddhism arose in Greater Magadha, which stretched from Sravasti, the capital of Kosala in the north-west, to Rajagrha in the south east. This land, to the east of aryavarta, the land of the Aryas, was recognised as non-Vedic. Other Vedic texts reveal a dislike of the people of Magadha, in all probability because the Magadhas at this time were not Brahmanised. It was not until the 2nd or 3rd centuries BCE that the eastward spread of Brahmanism into Greater Magadha became significant. Ideas that developed in Greater Magadha prior to this were not subject to Vedic influence. These include rebirth and karmic retribution that appear in a number of movements in Greater Magadha, including Buddhism. These movements inherited notions of rebirth and karmic retribution from an earlier culture. At the same time, these movements were influenced by, and in some respects continued, philosophical thought within the Vedic tradition as reflected e.g. in the Upanishads. These movements included, besides Buddhism, various skeptics (such as Sanjaya Belatthiputta), atomists (such as Pakudha Kaccayana), materialists (such as Ajita Kesakambali), antinomians (such as Purana Kassapa); the most important ones in the 5th century BCE were the Ajivikas, who emphasized the rule of fate, the Lokayata (materialists), the Ajnanas (agnostics) and the Jains, who stressed that the soul must be freed from matter. Many of these new movements shared the same conceptual vocabulary—atman ("Self"), buddha ("awakened one"), dhamma ("rule" or "law"), karma ("action"), nirvana ("extinguishing"), samsara ("eternal recurrence") and yoga ("spiritual practice"). The shramanas rejected the Veda, and the authority of the brahmans, who claimed they possessed revealed truths not knowable by any ordinary human means. Moreover, they declared that the entire Brahmanical system was fraudulent: a conspiracy of the brahmans to enrich themselves by charging exorbitant fees to perform bogus rites and give useless advice. A particular criticism of the Buddha was Vedic animal sacrifice. The Buddha declared that priests reciting the Vedas were like the blind leading the blind. According to him, those priests who had memorized the Vedas really knew nothing. He also mocked the Vedic "hymn of the cosmic man". However, the Buddha was not anti-Vedic, and declared that the Veda in its true form was declared by "Kashyapa" to certain rishis, who by severe penances had acquired the power to see by divine eyes. He names the Vedic rishis, and declared that the original Veda of the rishis was altered by a few Brahmins who introduced animal sacrifices. The Buddha says that it was on this alteration of the true Veda that he refused to pay respect to the Vedas of his time. He declared that the primary goal of Upanishadic thought, the Atman, was in fact non-existent, and, having explained that Brahminical attempts to achieve liberation at death were futile, proposed his new idea of liberation in life. However, he did not denounce the union with Brahman, or the idea of the self uniting with the Self. At the same time, the traditional Brahminical religion itself gradually underwent profound changes, transforming it into what is recognized as early Hinduism. In particular, the brahmans thus developed "philosophical systems of their own, meeting the new ideas with adaptations of their doctrines". A core problem in the study of early Buddhism is the relation between dhyana and insight. Schmithausen, in his often-cited article On some Aspects of Descriptions or Theories of 'Liberating Insight' and 'Enlightenment' in Early Buddhism notes that the mention of the four noble truths as constituting "liberating insight", which is attained after mastering the Rupa Jhanas, is a later addition to texts such as Majjhima Nikaya 36. Bruce Matthews notes that there is no cohesive presentation of karma in the Sutta Pitaka, which may mean that the doctrine was incidental to the main perspective of early Buddhist soteriology. Schmithausen is a notable scholar who has questioned whether karma already played a role in the theory of rebirth of earliest Buddhism. [note 22] According to Vetter, the Buddha at first sought "the deathless" (amata/amrta), which is concerned with the here and now. According to Vetter, only after this realization did he become acquanted with the doctirne of rebirth. Bronkhorst disagrees, and concludes that the Buddha "introduced a concept of karma that differed considerably from the commonly held views of his time." According to Bronkhorst, not physical and mental activities as such were seen as responsible for rebirth, but intentions and desire. According to Tilmann Vetter, the core of earliest Buddhism is the practice of dhyāna. Bronkhorst agrees that dhyana was a Buddhist invention, whereas Norman notes that "the Buddha's way to release [...] was by means of meditative practices." Discriminating insight into transiency as a separate path to liberation was a later development. According to Vetter, the description of the Buddhist path may initially have been as simple as the term "the middle way". In time, this short description was elaborated, resulting in the description of the eightfold path. According to both Bronkhorst and Anderson, the four truths became a substitution for prajna, or "liberating insight", in the suttas in those texts where "liberating insight" was preceded by the four jhanas. According to Bronkhorst, the four truths may not have been formulated in earliest Buddhism, and did not serve in earliest Buddhism as a description of "liberating insight". Gotama's teachings may have been personal, "adjusted to the need of each person." The three marks of existence may reflect Upanishadic or other influences. K.R. Norman supposes that the these terms were already in use at the Buddha's time, and were familiair to his hearers. The Brahma-vihara was in origin probably a brahmanical term; but is usage may have been common to the shramanic traditions. 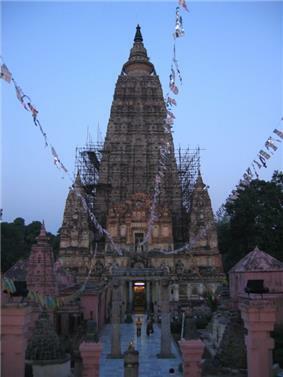 The history of Indian Buddhism may be divided into five periods: Early Buddhism (occasionally called Pre-sectarian Buddhism), Nikaya Buddhism or Sectarian Buddhism: The period of the Early Buddhist schools, Early Mahayana Buddhism, Later Mahayana Buddhism, and Esoteric Buddhism (also called Vajrayana Buddhism). Pre-sectarian Buddhism is the earliest phase of Buddhism, recognized by nearly all scholars. Its main scriptures are the Vinaya Pitaka and the four principal Nikayas or Agamas. Certain basic teachings appear in many places throughout the early texts, so most scholars conclude that Gautama Buddha must have taught something similar to the Three marks of existence, the Five Aggregates, dependent origination, karma and rebirth, the Four Noble Truths, the Noble Eightfold Path, and nirvana. Some scholars disagree, and have proposed many other theories. According to the scriptures, soon after the parinirvāṇa (from Sanskrit: "highest extinguishment") of Gautama Buddha, the first Buddhist council was held. As with any ancient Indian tradition, transmission of teaching was done orally. The primary purpose of the assembly was to collectively recite the teachings to ensure that no errors occurred in oral transmission. In the first council, Ānanda, a cousin of the Buddha and his personal attendant, was called upon to recite the discourses (sūtras, Pāli suttas) of the Buddha, and, according to some sources, the abhidhamma. Upāli, another disciple, recited the monastic rules (vinaya). Scholars regard the traditional accounts of the council as greatly exaggerated if not entirely fictitious. According to most scholars, at some period after the Second Council the Sangha began to break into separate factions. The various accounts differ as to when the actual schisms occurred. According to the Dipavamsa of the Pāli tradition, they started immediately after the Second Council, the Puggalavada tradition places it in 137 AN, the Sarvastivada tradition of Vasumitra says it was in the time of Ashoka and the Mahasanghika tradition places it much later, nearly 100 BCE. The root schism was between the Sthaviras and the Mahāsāṅghikas. The fortunate survival of accounts from both sides of the dispute reveals disparate traditions. The Sthavira group offers two quite distinct reasons for the schism. 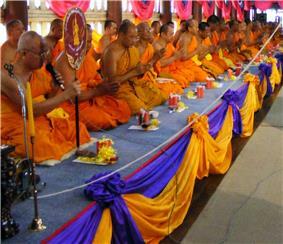 The Dipavamsa of the Theravāda says that the losing party in the Second Council dispute broke away in protest and formed the Mahasanghika. This contradicts the Mahasanghikas' own vinaya, which shows them as on the same, winning side. The Mahāsāṅghikas argued that the Sthaviras were trying to expand the vinaya and may also have challenged what they perceived were excessive claims or inhumanly high criteria for arhatship. Both parties, therefore, appealed to tradition. The Sthaviras gave rise to several schools, one of which was the Theravāda school. Originally, these schisms were caused by disputes over vinaya, and monks following different schools of thought seem to have lived happily together in the same monasteries, but eventually, by about 100 CE if not earlier, schisms were being caused by doctrinal disagreements too. Following (or leading up to) the schisms, each Saṅgha started to accumulate an Abhidharma, a detailed scholastic reworking of doctrinal material appearing in the Suttas, according to schematic classifications. These Abhidharma texts do not contain systematic philosophical treatises, but summaries or numerical lists. Scholars generally date these texts to around the 3rd century BCE, 100 to 200 years after the death of the Buddha. Therefore the seven Abhidharma works are generally claimed not to represent the words of the Buddha himself, but those of disciples and great scholars. Every school had its own version of the Abhidharma, with different theories and different texts. The different Abhidharmas of the various schools did not agree with each other. Scholars disagree on whether the Mahasanghika school had an Abhidhamma Pitaka or not. The origins of Mahāyāna, which formed between 100 BCE and 100 AD, are still not completely understood. The earliest views of Mahāyāna Buddhism in the West assumed that it existed as a separate school in competition with the so-called "Hīnayāna" schools. The split was on the order of the European Protestant Reformation, which divided Christians into Catholic and Protestant. Due to the veneration of buddhas and bodhisattvas, Mahāyāna was often interpreted as a more devotional, lay-inspired form of Buddhism, with supposed origins in stūpa veneration. The old views of Mahāyāna as a lay-inspired sect are now largely considered misguided and wrong. There is no evidence that Mahāyāna ever referred to a separate formal school or sect of Buddhism, but rather that it existed as a certain set of ideals, and later doctrines, for bodhisattvas. Initially it was known as Bodhisattvayāna (the "Vehicle of the Bodhisattvas"). Paul Williams has also noted that the Mahāyāna never had nor ever attempted to have a separate Vinaya or ordination lineage from the early schools of Buddhism, and therefore each bhikṣu or bhikṣuṇī adhering to the Mahāyāna formally belonged to an early school. This continues today with the Dharmaguptaka ordination lineage in East Asia, and the Mūlasarvāstivāda ordination lineage in Tibetan Buddhism. Therefore Mahāyāna was never a separate rival sect of the early schools. From Chinese monks visiting India, we now know that both Mahāyāna and non-Mahāyāna monks in India often lived in the same monasteries side by side. Both adopt one and the same Vinaya, and they have in common the prohibitions of the five offences, and also the practice of the Four Noble Truths. Those who venerate the bodhisattvas and read the Mahāyāna sūtras are called the Mahāyānists, while those who do not perform these are called the Hīnayānists. Much of the early extant evidence for the origins of Mahāyāna comes from early Chinese translations of Mahāyāna texts. These Mahāyāna teachings were first propagated into China by Lokakṣema, the first translator of Mahāyāna sūtras into Chinese during the 2nd century CE. Some scholars have traditionally considered the earliest Mahāyāna sūtras to include the very first versions of the Prajñāpāramitā series, along with texts concerning Akṣobhya Buddha, which were probably composed in the 1st century BCE in the south of India. During the period of Late Mahayana Buddhism, four major types of thought developed: Madhyamaka, Yogacara, Tathagatagarbha, and Buddhist Logic as the last and most recent. In India, the two main philosophical schools of the Mahayana were the Madhyamaka and the later Yogacara. According to Dan Lusthaus, Madhyamaka and Yogacara have a great deal in common, and the commonality stems from early Buddhism. There were no great Indian teachers associated with tathagatagarbha thought. Vajrayana Buddhism was influenced by Hinduism, and therefore research must include exploring Hinduism as well. The scriptures of Vajrayana have not yet been put in any kind of order. Ritual must be examined as well, not just doctrine. Buddhist proselytism at the time of emperor Ashoka (260–218 BCE). Buddhism may have spread only slowly in India until the time of the Mauryan emperor Ashoka, who was a public supporter of the religion. 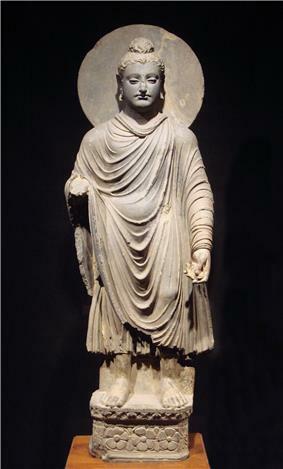 The support of Aśoka and his descendants led to the construction of more stūpas (Buddhist religious memorials) and to efforts to spread Buddhism throughout the enlarged Maurya empire and even into neighboring lands—particularly to the Iranian-speaking regions of Afghanistan and Central Asia, beyond the Mauryas' northwest border, and to the island of Sri Lanka south of India. 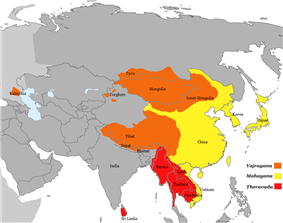 These two missions, in opposite directions, would ultimately lead, in the first case to the spread of Buddhism into China, and in the second case, to the emergence of Theravāda Buddhism and its spread from Sri Lanka to the coastal lands of Southeast Asia. 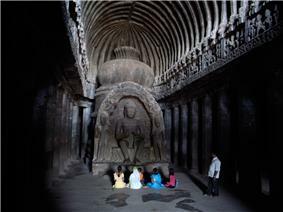 This period marks the first known spread of Buddhism beyond India. According to the edicts of Aśoka, emissaries were sent to various countries west of India to spread Buddhism (Dharma), particularly in eastern provinces of the neighboring Seleucid Empire, and even farther to Hellenistic kingdoms of the Mediterranean. It is a matter of disagreement among scholars whether or not these emissaries were accompanied by Buddhist missionaries. The gradual spread of Buddhism into adjacent areas meant that it came into contact with new ethnical groups. During this period Buddhism was exposed to a variety of influences, from Persian and Greek civilization, to changing trends in non-Buddhist Indian religions—themselves influenced by Buddhism. 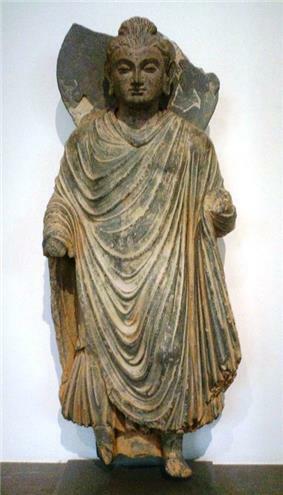 Striking examples of this syncretistic development can be seen in the emergence of Greek-speaking Buddhist monarchs in the Indo-Greek Kingdom, and in the development of the Greco-Buddhist art of Gandhāra. 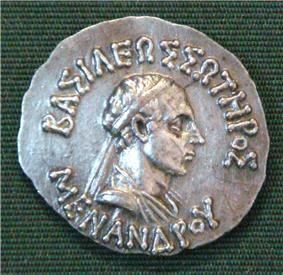 A Greek king, Menander, has even been immortalized in the Buddhist canon. The Theravada school spread south from India in the 3rd century BCE, to Sri Lanka and Thailand and Burma and later also Indonesia. 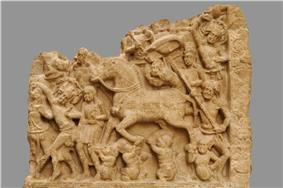 The Dharmagupta school spread (also in 3rd century BCE) north to Kashmir, Gandhara and Bactria (Afghanistan). 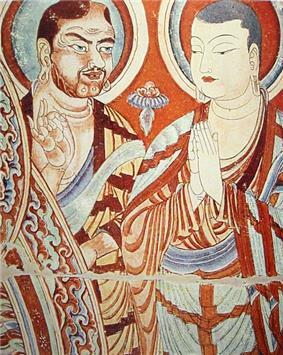 The Silk Road transmission of Buddhism to China is most commonly thought to have started in the late 2nd or the 1st century CE, though the literary sources are all open to question. The first documented translation efforts by foreign Buddhist monks in China were in the 2nd century CE, probably as a consequence of the expansion of the Kushan Empire into the Chinese territory of the Tarim Basin. In the 2nd century CE, Mahayana Sutras spread to China, and then to Korea and Japan, and were translated into Chinese. During the Indian period of Esoteric Buddhism (from the 8th century onwards), Buddhism spread from India to Tibet and Mongolia. By the late Middle Ages, Buddhism had become virtually extinct in India, and although it continued to exist in surrounding countries, its influence was no longer expanding. It is now again gaining strength worldwide. China and India are now starting to fund Buddhist shrines in various Asian countries as they compete for influence in the region. Theravada Buddhism, using Pāli as its scriptural language, is the dominant form of Buddhism in Cambodia, Laos, Thailand, Sri Lanka, and Burma. The Dalit Buddhist movement in India (inspired by B. R. Ambedkar) also practices Theravada. East Asian forms of Mahayana Buddhism that use Chinese scriptures are dominant in most of China, Japan, Korea, Taiwan, Singapore and Vietnam as well as such communities within Indochina, Southeast Asia and the West. 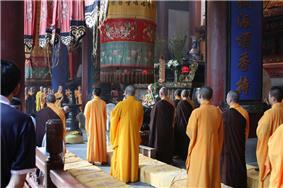 Vietnam and Singapore are major concentrations of Mahayana Buddhism in Southeast Asia. Tibetan Buddhism is found in Tibet, Bhutan, Nepal, Mongolia, areas of India (it's the majority religion in Ladakh; significant population in Himachal Pradesh, Arunachal Pradesh and Sikkim), China (particularly in Inner Mongolia), and Russia (mainly Kalmykia, Buryatia, and Tuva). Formal membership varies between communities, but basic lay adherence is often defined in terms of a traditional formula in which the practitioner takes refuge in The new forms of Buddhism that significantly depart from traditional beliefs and practices. Overall there is an overwhelming diversity of recent forms of Buddhism. A number of modern movements or tendencies in Buddhism emerged during the second half of the 20th Century, including the Dalit Buddhist movement (also sometimes called 'neo-Buddhism'), Engaged Buddhism, and the further development of various Western Buddhist traditions. In the second half of the 20th Century a modern movement in Nichiren Buddhism: Soka Gakkai (Value Creation Society) emerged in Japan and spread further to other countries. Soka Gakkai International (SGI) is a lay Buddhist movement linking more than 12 million people around the world, and is currently described as "the most diverse” and “the largest Lay Buddhist movement in the world”. Percentage of Buddhists by country, according to the Pew Research Center, as of 2010. Buddhism is practiced by an estimated 488 million, 495 million, or 535 million people as of the 2010s, representing 7% to 8% of the world's total population. China is the country with the largest population of Buddhists, approximately 244 million or 18.2% of its total population. They are mostly followers of Chinese schools of Mahayana, making this the largest body of Buddhist traditions. Mahayana, also practiced in broader East Asia, is followed by over half of world Buddhists. According to a demographic analysis reported by Peter Harvey (2013): Mahayana has 360 million adherents; Theravada has 150 million adherents; and Vajrayana has 18,2 million adherents. Seven million additional Buddhists are found outside of Asia. According to Johnson and Grim (2013), Buddhism has grown from a total of 138 million adherents in 1910, of which 137 million were in Asia, to 495 million in 2010, of which 487 million are in Asia. Buddhists generally classify themselves as either Theravada or Mahayana. This classification is also used by some scholars and is the one ordinarily used in the English language. An alternative scheme used by some scholars divides Buddhism into the following three traditions or geographical or cultural areas: Theravada, East Asian Buddhism and Tibetan Buddhism. Some scholars use other schemes. Buddhists themselves have a variety of other schemes. "Buddhism — objects, art and history". Asia. Wei, Wei Wu (1960). "Why Lazarus Laughed: The Essential Doctrine Zen-Advaita-Tantra". Routledge and Kegan Paul Ltd., London. Sentient Publications. Retrieved 2010-11-10. Armstrong, Karen (2001). Buddha. Penguin Books. p. 187. Bareau, André (1955). 'Les Sectes bouddhiques du Petit Véhicule. Saigon: École Française d'Extrême-Orient. Bechert, Heinz & Richard Gombrich (ed.) (1984). The World of Buddhism, Thames & Hudson. Bronkhorst, Johannes (1993), The Two Traditions Of Meditation In Ancient India, Motilal Banarsidass Publ. Buswell, Robert E. (ed.) (2003). Encyclopedia of Buddhism. MacMillan Reference Books. Coogan, Michael D. (ed.) (2003). The Illustrated Guide to World Religions. Oxford University Press. Cousins, L. S. (1996). "The Dating of the Historical Buddha: A Review Article". Journal of the Royal Asiatic Society. Series 3 (6.1): 57–63. ; reprinted in Williams, Buddhism, volume I; NB in the online transcript a little text has been accidentally omitted: in section 4, between "... none of the other contributions in this section envisage a date before 420 B.C." and "to 350 B.C." insert "Akira Hirakawa defends the short chronology and Heinz Bechert himself sets a range from 400 B.C." Davidson, Ronald M. (2003). Indian Esoteric Buddhism: A Social History of the Tantric Movement. New York: Columbia University Press. de Give, Bernard (2006). Les rapports de l'Inde et de l'Occident des origines au règne d'Asoka. Les Indes savants. Donath, Dorothy C. (1971). Buddhism for the West: Theravāda, Mahāyāna and Vajrayāna; a comprehensive review of Buddhist history, philosophy, and teachings from the time of the Buddha to the present day. Julian Press. Embree, Ainslie T. (ed. ), Stephen N. Hay (ed. ), Wm. Theodore de Bary (ed. ), A.L. Bashram, R.N. Dandekar, Peter Hardy, J.B. Harrison, V. Raghavan, Royal Weiler, and Andrew Yarrow (1958; 2nd ed. 1988). Sources of Indian Tradition: From the Beginning to 1800 (vol. 1). NY: Columbia U. Press. ISBN 0-231-06651-1. Gethin, Rupert (1998). Foundations of Buddhism. Oxford University Press. Goleman, Daniel (2008). Destructive Emotions: A Scientific Dialogue with the Dalai Lama. Bantam. Kindle Edition. Gombrich, Richard F. (1988; 6th reprint, 2002). Theravāda Buddhism: A Social History from Ancient Benares to Modern Colombo (London: Routledge). ISBN 0-415-07585-8. Harvey, Peter (1990). An Introduction to Buddhism: Teachings, History and Practices. Cambridge University Press. Hawkins, Bradley K. (1999). The Pocket Idiots Guide: Buddhism. Laurence King (Penguin, Alpha). Hill, John E. (2009) Through the Jade Gate to Rome: A Study of the Silk Routes during the Later Han Dynasty, 1st to 2nd Centuries CE. BookSurge, Charleston, South Carolina. ISBN 978-1-4392-2134-1. Indian Books Centre. Bibliotheca Indo Buddhica Series, Delhi. Juergensmeyer, Mark (2006). The Oxford Handbook of Global Religions. Oxford Handbooks in Religion and Theology. Oxford University Press. Keown, Damien and Charles S Prebish (eds.) (2004). Encyclopedia of Buddhism (London: Routledge). ISBN 978-0-415-31414-5. Kohn, Michael H. (trans.) (1991). The Shambhala Dictionary of Buddhism and Zen. Shambhala. Lamotte, Étienne (trans. from French) (1976). Teaching of Vimalakirti. trans. Sara Boin. London: Pali Text Society. XCIII. Lowenstein, Tom (1996). The Vision of the Buddha. Duncan Baird Publishers. Nattier, Jan (2003). A Few Good Men: The Bodhisattva Path according to The Inquiry of Ugra (Ugrapariprccha). University of Hawai'i Press. Ranjini. Jewels of the Doctrine. Buddhist Stories of the Thirteenth Century (Sri Satguru Publications). Robinson, Richard H. and Willard L. Johnson (1970; 3rd ed., 1982). The Buddhist Religion: A Historical Introduction (Belmont, California: Wadsworth Publishing). ISBN 0-534-01027-X. Ito, Shinjo (2009). Shinjo:Reflections. Somerset Hall Press. Sinha, H.P. (1993). Bhāratīya Darshan kī rūprekhā (Features of Indian Philosophy). Motilal Banarasidas Publ. Skilton, Andrew (1997). A Concise History of Buddhism. Windhorse Publications. Smith, Huston; Phillip Novak (2003). Buddhism: A Concise Introduction. HarperSanFrancisco. White, Kenneth (2005). The Role of Bodhicitta in Buddhist Enlightenment Including a Translation into English of Bodhicitta-sastra, Benkemmitsu-nikyoron, and Sammaya-kaijo. The Edwin Mellen Press. ISBN 0-7734-5985-5. Williams, Paul (1989). Mahayana Buddhism: the doctrinal foundations. London: Routledge. Williams, Paul (ed.) (2005). Buddhism: Critical Concepts in Religious Studies, 8 volumes, Routledge, London & New York. Williams, Paul with Anthony Tribe (2000). Buddhist Thought (London: Routledge). ISBN 0-415-20701-0. Retrieved 29 Nov 2008 from "Google Books". Zürcher, E. (1972). The Buddhist Conquest of China. Leiden. E. J. Brill. First published in 1959. ^ a b "Buddhism". (2009). In Encyclopædia Britannica. Retrieved November 26, 2009, from Encyclopædia Britannica Online Library Edition. ^ Padmasambhava, Jamgon Kongtrul, Erik Pema Kunsang (2004). Light of Wisdom. Rangjung Yeshe Publications. ^ Lopez (1995). Buddhism in Practice. Princeton University Press. p. 16. ^ Carrithers, Michael. "The Buddha", in the Oxford University paperback Founders of Faith, 1986, p. 10. ^ a b Richard Gombrich, Theravada Buddhism: A Social History from Ancient Benares to Modern Colombo. Routledge and Kegan Paul, 1988, page 49. ^ Kohn, Michael (1991). The Shambhala Dictionary of Buddhism and Zen. Shambhala. p. 143. ^ "The Middle Way of the Buddha". Buddhamind.info. Retrieved 2011-10-24. ^ "Buddhism - The Middle Path". Buddhanet.net. Retrieved 2011-10-24. ^ Bareau 1955, p. 212–223. ^ The Connected Discourses of the Buddha. A Translation of the Samyutta Nikaya, Bhikkhu Bodhi, Translator. Wisdom Publications. ^ a b Ajahn Sucitto 2010, p. 87-88. ^ Gethin 1998, p. 82. ^ a b Armstrong, p. 77. ^ Nhat Hahn, Thich, p. 36. ^ a b Roth, Beth. "Family Dharma: A Bedtime Ritual". Tricycle (Tricycle Foundation). Retrieved January 11, 2011. ^ Chodron, Pema (2002). The Places that Scare You: A Guide to Fearlessness in Difficult Times. Shambhala via Amazon Look Inside. p. 37. ^ "Unit Six: The Four Immeasurables". Buddha Dharma Education Association & Buddhanet. and "Unit Six: Loving-Kindness". Buddha Dharma Education Association & Buddhanet. Retrieved January 10, 2011. ^ "A View on Buddhism: The Four Immeasurables". Rudy Harderwijk (viewonbuddhism.org). Retrieved January 11, 2011. ^ Jeffrey Po, "Is Buddhism a Pessimistic Way of Life?" ^ Prebish, Charles (1993). Historical Dictionary of Buddhism. The Scarecrow Press. ^ Keown, Damien (2003). Dictionary of Buddhism. ^ Thanissaro Bhikkhu, The Not-Self Strategy, See Point 3 – The Canon quote Thanissaro Bhikkhu draws attention to is the Sabbasava Sutta. ^ "Upādāparitassanā Sutta". Buddha-Vacana. Retrieved 18 September 2013. ^ Christian Lindtner, Master of Wisdom. Dharma Publishing 1997, p. 324. ^ Dan Lusthaus, "What is and isn't Yogacara"
^ Williams, Paul. Buddhist Thought. Routledge 2000, page 161. ^ Hawkins, pp. 40, 46. 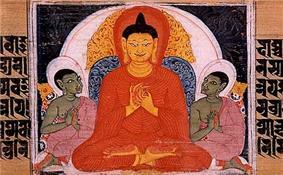 ^ 'Access to Insight'', a Theravada Buddhist website, discusses Buddha Eras"'". Accesstoinsight.org. 2010-06-05. Retrieved 2010-08-25. ^ "Gautama Buddha discusses the Maitreya Buddha in the Tipitaka". Accesstoinsight.org. 2010-06-08. Retrieved 2010-08-25. ^ "Bodhisattva Ideal in Buddhism". Access to Insight. Retrieved 2010-10-18. ^ Mall, Linnart. Studies in the Astasahasrika Prajnaparamita and Other Essays. Motilal Banarsidass. 2005. pp. 53-54. ^ Hirakawa, Akira. A History of Indian Buddhism: from Śākyamuni to Early Mahāyāna. Motilal Banarsidass. 2007. p. 297. ^ Conze, Edward. The Perfection of Wisdom in Eight Thousand Lines and its Verse Summary. Grey Fox Press. 2001. p. 89. ^ Barbara Stoler Miller, Yoga: Discipline of Freedom: the Yoga Sutra Attributed to Patanjali; a Translation of the Text, with Commentary, Introduction, and Glossary of Keywords. University of California Press, 1996, page 8. ^ Alexander Wynne, The Origin of Buddhist Meditation. Routledge, 2007, page 73. ^ Alexander Wynne, The Origin of Buddhist Meditation. Routledge, 2007, page 105. ^ Michael Carrithers, The Buddha. Taken from Founders of Faith, published by Oxford University Press, 1986, page 30. ^ Alexander Wynne, The origin of Buddhist meditation. Routledge, 2007, p. 72. ^ a b "Dharmacarini Manishini". Western Buddhist Review. ^ Richard Gombrich, Theravada Buddhism: A Social History from Ancient Benares to Modern Colombo. Routledge and Kegan Paul, 1988, page 44. ^ Johannes Bronkhorst, The Two Traditions of Mediation in Ancient India. Franz Steiner Verlag Weisbaden GmbH, pages 1-17. ^ Randall Collins, The Sociology of Philosophies: A Global Theory of Intellectual Change. Harvard University Press, 2000, page 199. ^ a b Alexander Wynne, The Origin of Buddhist Meditation. Routledge 2007, page 51. ^ Alexander Wynne, The Origin of Buddhist Meditation. Routledge 2007, page 56. ^ Bhikku, Thanissaro (2001). "Refuge". An Introduction to the Buddha, Dhamma, & Sangha. Access to Insight. ^ Stewart McFarlane in Peter Harvey, ed., Buddhism. Continuum, 2001, page 187. ^ Stewart McFarlane in Peter Harvey, ed., Buddhism. Continuum, 2001, pages 195-196. ^ Morgan, Peggy; Lawton, Clive A., eds. (2007). Ethical Issues in Six Religious Traditions (2nd ed.). Edinburgh: Edinburgh University Press. pp. 62–63. ^ Richard Gombrich, Theravada Buddhism: A Social History from Ancient Benares to Modern Colombo. Routledge and Kegan Paul, 1988, page 89. He is quoting Carrithers. ^ B. Alan Wallace, Contemplative Science. Columbia University Press, 2007, p. 81. ^ Peter Harvey, An Introduction to Buddhism. Cambridge University Press, 1990, page 144. ^ Prebish comments (op. cit., p. 244): "It presumes that sitting in meditation itself (i.e. 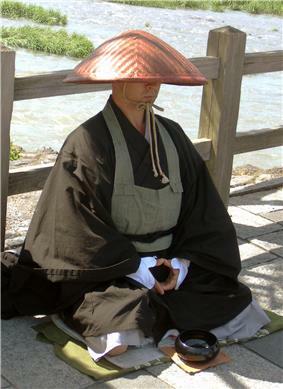 zazen) is an expression of Buddha nature." The method is to detach the mind from conceptual modes of thinking and perceive Reality directly. Speaking of Zen in general, Buddhist scholar Stephen Hodge writes (Zen Masterclass, Godsfield Press, 2002, pp. 12–13): "... practitioners of Zen believe that Enlightenment, the awakening of the Buddha-mind or Buddha-nature, is our natural state, but has been covered over by layers of negative emotions and distorted thoughts. According to this view, Enlightenment is not something that we must acquire a bit at a time, but a state that can occur instantly when we cut through the dense veil of mental and emotional obscurations." ^ (Critical Sermons on the Zen Tradition, Hisamatsu Shin'ichi, Palgrave Macmillan, New York, 2002, passim) Commenting on Rinzai Zen and its Chinese founder, Linji, Hisamatsu states: "Linji indicates our true way of being in such direct expressions as 'True Person' and 'True Self'. It is independent of words or letters and transmitted apart from scriptural teaching. Buddhism doesn't really need scriptures. It is just our direct awakening to Self ..." (Hisamatsu, op. cit., p. 46). ^ Routledge Encyclopedia of Buddhism, p. 781 . ^ a b c Encyclopædia Britannica Online. Buddhism: The foundations of Buddhism: The cultural context. Retrieved 19-07-2009. ^ a b Encyclopædia Britannica Online. Hinduism: History of Hinduism: The Vedic period (2nd millennium - 7th century BCE); Challenges to Brahmanism (6th - 2nd century BCE); Early Hinduism (2nd century BCE - 4th century CE). Retrieved 19-07-2009. ^ Y. Masih (2000) In : A Comparative Study of Religions, Motilal Banarsidass Publ : Delhi, ISBN 81-208-0815-0 Page 18. "There is no evidence to show that Jainism and Buddhism ever subscribed to vedic sacrifices, vedic deities or caste. They are parallel or native religions of India and have contributed to much to the growth of even classical Hinduism of the present times." ^ S. Cromwell Crawford, review of L. M. Joshi, Brahmanism, Buddhism and Hinduism, Philosophy East and West (1972): "Alongside Brahmanism was the non-Aryan Shramanic culture with its roots going back to prehistoric times." ^ "This confirms that the doctrine of transmigration is non-aryan and was accepted by non-vedics like Ajivikism, Jainism and Buddhism. The Indo-aryans have borrowed the theory of re-birth after coming in contact with the aboriginal inhabitants of India. Certainly Jainism and non-vedics [..] accepted the doctrine of rebirth as supreme postulate or article of faith." Masih, page 37. ^ Karel Werner, The Longhaired Sage in The Yogi and the Mystic. Karel Werner, ed., Curzon Press, 1989, page 34. "Rahurkar speaks of them as belonging to two distinct 'cultural strands' ... Wayman also found evidence for two distinct approaches to the spiritual dimension in ancient India and calls them the traditions of 'truth and silence.' He traces them particularly in the older Upanishads, in early Buddhism, and in some later literature." ^ Gavin D. Flood (1996), An Introduction to Hinduism, Cambridge University — Press : UK ISBN 0-521-43878-0 - "The origin and doctrine of Karma and Samsara are obscure. These concepts were certainly circulating amongst sramanas, and Jainism and Buddhism developed specific and sophisticated ideas about the process of transmigration. It is very possible that the karmas and reincarnation entered the mainstream brahaminical thought from the sramana or the renouncer traditions." Page 86. ^ Padmanabh S. Jaini 2001 "Collected Paper on Buddhist Studies" Motilal Banarsidass Publ 576 pages ISBN 81-208-1776-1: "Yajnavalkya's reluctance and manner in expounding the doctrine of karma in the assembly of Janaka (a reluctance not shown on any other occasion) can perhaps be explained by the assumption that it was, like that of the transmigration of soul, of non-brahmanical origin. In view of the fact that this doctrine is emblazoned on almost every page of sramana scriptures, it is highly probable that it was derived from them." Page 51. ^ Govind Chandra Pande, (1994) Life and Thought of Sankaracarya, Motilal Banarsidass ISBN 81-208-1104-6 : Early Upanishad thinkers like Yajnavalkya were acquainted with the sramanic thinking and tried to incorporate these ideals of Karma, Samsara and Moksa into the vedic thought implying a disparagement of the vedic ritualism and recognising the mendicancy as an ideal. Page 135. ^ "The sudden appearance of this theory [of karma] in a full-fledged form is likely due, as already pointed out, to an impact of the wandering muni-and-shramana-cult, coming down from the pre-Vedic non-Aryan time." Kashi Nath Upadhyaya, Early Buddhism and the Bhagavadgita. Motilal Banarsidass Publ., 1998, page 76. ^ Walpola Rahula, What the Buddha Taught, pages 9-10. ^ "The brahmin by caste alone, the teacher of the Veda, is (jokingly) etymologized as the 'non-meditator' (ajhāyaka). Brahmins who have memorized the three Vedas (tevijja) really know nothing: it is the process of achieving Enlightenment — what the Buddha is said to have achieved in the three watches of that night—which constitutes the true 'three knowledges.'" R.F. Gombrich in Paul Williams, ed., "Buddhism: Critical Concepts in Religious Studies." Taylor and Francis 2006, page 120. ^ Richard Gombrich, Theravada Buddhism: A Social History from Ancient Benares to Modern Colombo. Routledge and Kegan Paul, 1988, page 85. ^ Michael Carrithers, The Buddha, 1983, pages 41-42. Found in Founders of Faith, Oxford University Press, 1986. ^ Alexander Wynne, The Origin of Buddhist Meditation. Routledge 2007, page 21. ^ Encyclopædia Britannica Online. Vedic religion. Retrieved 19-07-2009. ^ a b Vetter 1988, p. ix. ^ a b c d e f Bronkhorst 1993. ^ a b c d e f g Vetter 1988. ^ a b c d Gombrich 1997. ^ a b c Schmithausen 1981. ^ Bronkhorst 1993, p. vii. ^ a b Warder & 1999 inside flap. ^ Bronkhorst 1997, p. viii. ^ Davidson 2003, p. 147. ^ a b Jong 1993, p. 25. ^ Bronkhorst 1997, p. vii. ^ a b Matthews 1986, p. 124. ^ Bronkhorst 1998, p. 13. ^ Schmithausen 1986, p. 206-207. ^ Bronkhorst 1998, p. 3. ^ Bronkhorst 1998, p. 16. ^ Bronkhorst 1998, p. 14. ^ a b Norman 1997, p. 29. ^ Vetter 1988, p. xxxiv-xxxvii. ^ Gombrich 1997, p. 131. ^ a b Vetter 1988, p. 5. ^ a b Vetter 1988, p. xv. ^ Bronkhorst 1993, p. 99-100, 102-111. ^ a b Bronkhorst 1993, p. 108. ^ Bronkhorst 1993, p. 107. ^ Norman 1997, p. 26. ^ Norman 1997, p. 28. ^ a b "Abhidhamma Pitaka." Encyclopædia Britannica. Ultimate Reference Suite. Chicago: Encyclopædia Britannica, 2008. ^ Encyclopedia of Buddhism. Routledge. p. 485. ^ a b c Keown, Damien (1996). Buddhism: A Very Short Introduction. Oxford University Press. pp. 58, 61. ^ "The south (of India) was then vigorously creative in producing Mahayana Sutras" – Warder, A.K. (3rd edn. 1999). Indian Buddhism: p. 335. ^ Peter Harvey, "An Introduction to Buddhism." Cambridge University Press, 1993, page 95. ^ Dan Lusthaus, Buddhist Phenomenology. Routledge, 2002, pages 236-237. ^ Peter Harvey, "An Introduction to Buddhism." Cambridge University Press, 1993, page 113. "There were no great Indian teachers associated with this strand of thought." ^ Zürcher (1972), pp. 22-27. ^ Hill (2009), p. 30, for the Chinese text from the Hou Hanshu, and p. 31 for a translation of it. ^ Zürcher (1972), p. 23. ^ Carol E. Henderson, Culture and Customs of India. Greenwood Publishing Group, 2002, page 42. ^ Joseph B. Tamney in William H. Swatos, editor, Encyclopedia of Religion and Society. Rowman Altamira, 1998, page 68. ^ Subir Bhaumik. "China and India use Buddha for regional karma.". Aljazeera.com. Retrieved 2013-06-18. ^ A. C. Paranjpe (30 September 1998). Self and identity in modern psychology and Indian thought. Springer. p. 351. ^ Urmilā Pavāra (June 2009). The weave of my life: a Dalit woman's memoirs. Columbia University Press. pp. xv–xviii. ^ Métraux, Daniel A. (2010). How Soka Gakkai Became a Global Buddhist Movement. 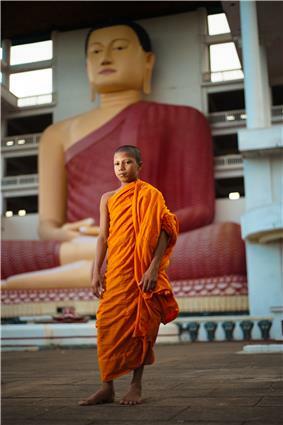 ^ Pew Research Center, Global Religious Landscape: Buddhists. ^ a b Johnson, Todd M.; Grim, Brian J. (2013). The World's Religions in Figures: An Introduction to International Religious Demography. Hoboken, NJ: Wiley-Blackwell. pp. 34–37. ^ a b Harvey, Peter (2013). An Introduction to Buddhism: Teachings, History and Practices (2nd ed.). Cambridge, UK: Cambridge University Press. p. 5. ^ Smith, Buddhism; Juergensmeyer, Oxford Handbook. ^ "Tibetan Buddhism". American Heritage Dictionary of the English Language. Houghton Mifflin Company. 2004. Retrieved 2007-07-07. ^ Cousins, L.S. (1996); Buswell (2003), Vol. I, p. 82; and, Keown & Prebish (2004), p. 107. See also, Gombrich (1988/2002), p. 32: “…[T]he best we can say is that [the Buddha] was probably Enlightened between 550 and 450, more likely later rather than earlier." ^ Williams (2000, pp. 6-7) writes: "As a matter of fact Buddhism in mainland India itself had all but ceased to exist by the thirteenth century CE, although by that time it had spread to Tibet, China, Japan, and Southeast Asia." Embree et al. (1958/1988), "Chronology," p. xxix: "c. 1000-1200: Buddhism disappears as [an] organized religious force in India." See also, Robinson & Johnson (1970/1982), pp. 100-1, 108 Fig. 1; and, Harvey (1990/2007), pp. 139-40. ^ Davidson, Ronald M. (2003). Indian Esoteric Buddhism: A Social History of the Tantric Movement. New York: Columbia University Press. ^ Peter Harvey, The Selfless Mind. Curzon Press, 1995, page 9. ^ David Kalupahana, "Sarvastivada and its theory of sarvam asti." University of Ceylon Review 24 1966, 94-105. ^ Harvey 1990, p. 1. ^ Goldstein 2011, p. 27. 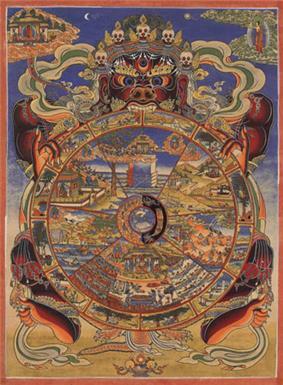 ^ Lama Surya Das 1997, p. 16. ^ Goleman 2008, Kindle Locations 1301-1305. ^ Gethin 1998, p. 65-66. ^ Keown 2000, Kindle Locations 361-372. ^ Pinburn 1990, p. 101. ^ Pyysiäinen, Ilkka (2003). "Buddhism, Religion, and the Concept of "God"". Man 50 (2): 147–171. ^ Southwold, Martin (Sep 1978). "Buddhism and The Definition of Religion". Man 13 (3): 362–379. ^ Walpola Rahula 2007, Kindle Locations 316-323. ^ "Is Buddhism a Religion?". The Huffington Post. August 6, 2010. Retrieved April 24, 2013. ^ Earlier Buddhist texts refer to five realms rather than six realms; when described as five realms, the god realm and demi-god realm constitute a single realm. ^ See the article Saṃsāra (Buddhism) for further details and citations. ^ See the article Four Noble Truths for further details and citations. In particular, the section "The four truths" within that article provides a footnote showing variety of translations of these four statements. ^ For clarification of translations, see Dukkha#Translating the term dukkha. ^ See the article Dukkha for further details and citations. ^ See the article Four Noble Truths for further details and citations. ^ Shaw also notes that discourses on meditation are addressed to "bhikkhave", but that in this context the terms is more generic than simply (male) "monks" and refers to all practitioners, and that this is confirmed by Buddhaghosa. ^ According to Charles S. Prebish: "Although a variety of Zen 'schools' developed in Japan, they all emphasize Zen as a teaching that does not depend on sacred texts, that provides the potential for direct realization, that the realization attained is none other than the Buddha nature possessed by each sentient being ...". ^ The surviving portions of the scriptures of Sarvastivada, Mulasarvastivada, Mahisasaka, Dharmaguptaka and other schools, and the Chinese Agamas and other surviving portions of other early canons. ^ Exemplary studies are the study on descriptions of "liberating insight" by Lambert Schmithausen, the overview of early Buddhism by Tilmann Vetter, the philological work on the four truths by K.R. Norman, the textual studies by Richard Gombrich, and the research on early meditation methods by Johannes Bronkhorst. ^ According to A.K. Warder, in his 1970 publication "Indian Buddhism", from the oldest extant texts a common kernel can be drawn out. According to Warder, c.q. his publisher: "This kernel of doctrine is presumably common Buddhism of the period before th great schisms of the fourth and third centuries BC. It may be substantially the Buddhism of the Buddha himself, although this cannot be proved: at any rate it is a Buddhism presupposed by the schools as existing about a hundred years after the parinirvana of the Buddha, and there is no evidence to suggest that it was formulated by anyone else than the Buddha and his immediate followers." ^ Richard Gombrich: "I have the greatest difficulty in accepting that the main edifice is not the work of a single genius. By "the main edifice" I mean the collections of the main body of sermons, the four Nikāyas, and of the main body of monastic rules." ^ Ronald Davidson: "While most scholars agree that there was a rough body of sacred literature (disputed)(sic) that a relatively early community (disputed)(sic) maintained and transmitted, we have little confidence that much, if any, of surviving Buddhist scripture is actually the word of the historic Buddha." ^ J.W. De Jong: "It would be hypocritical to assert that nothing can be said about the doctrine of earliest Buddhism [...] the basic ideas of Buddhism found in the canonical writings could very well have been proclaimed by him [the Buddha], transmitted and developed by his disciples and, finally, codified in fixed formulas." ^ Bronkhorst: "This position is to be preferred to (ii) for purely methodological reasons: only those who seek nay find, even if no success is guaranteed." ^ Lopez: "The original teachings of the historical Buddha are extremely difficult, if not impossible, to recover or reconstruct." ^ According to Schmithausen, "the karma doctrine may have been incidental to early Buddhist soteriology." ^ Vetter: [T]hey do not teach that one is released by knowing the four noble truths, but by practicing the fourth noble truth, the eighfold path, which culminates in right samadhi. ^ Vetter: "I am especially thinking here of MN 26 (I p.163,32; 165,15;166,35) kimkusalagavesi anuttaram santivarapadam pariyesamano (searching for that which is beneficial, seeking the unsurpassable, best place of peace) and again MN 26 (passim), anuttaramyagakkhemam nibbiinam pariyesati (he seeks the unsurpassable safe place, the nirvana). Anuppatta-sadattho (one who has reached the right goal) is also a vague positive expression in the Arhatformula in MN 35 (I p, 235), see chapter 2, footnote 3, Furthermore, satthi (welfare) is important in e.g. SN 2.12 or 2.17 or Sn 269; and sukha and rati (happiness), in contrast to other places, as used in Sn 439 and 956. The oldest term was perhaps amata (immortal, immortality) [...] but one could say here that it is a negative term." Friedrich Nietzsche criticized Buddhism for promoting what he saw as nihilism. Some Marxist groups have criticized Buddhism for causing Tibet to have an undeveloped, agrarian economy. Surya Das states: "For Buddhism is less a theology or religion than a promise that certain meditative practices and mind trainings can effectively show us how to awaken our Buddha-nature and liberate us from suffering and confusion." B. Alan Wallace states: "When we in the West first engage with Buddhism, it is almost inevitable that we bring out one of our familiar stereotypes and apply it to Buddhism, calling it simply a 'religion.'... But Buddhism has never been simply a religion as we define it in the West. From the very beginning it has also had philosophical elements, as well as empirical and rational elements that may invite the term 'science.'" Rupert Gethin states: "I am not concerned here to pronounce on a question that is sometimes asked of Buddhism: is it a religion? Obviously it depends on how one defines ‘a religion’. What is certain, however, is that Buddhism does not involve belief in a creator God who has control over human destiny, nor does it seek to define itself by reference to a creed; as Edward Conze has pointed out, it took over 2,000 years and a couple of Western converts to Buddhism to provide it with a creed. On the other hand, Buddhism views activities that would be generally understood as religious—such as devotional practices and rituals—as a legitimate, useful, and even essential part of the practice and training that leads to the cessation of suffering." Damien Keown states: "Problems [...] confront us as soon as we try to define what Buddhism is. Is it a religion? A philosophy? A way of life? A code of ethics? It is not easy to classify Buddhism as any of these things, and it challenges us to rethink some of these categories. What, for example, do we mean by ‘religion’? Most people would say that religion has something to do with belief in God. [...] If belief in God in this sense is the essence of religion, then Buddhism cannot be a religion. [...] Some have suggested that a new category – that of the ‘non-theistic’ religion – is needed to encompass Buddhism. Another possibility is that our original definition is simply too narrow. The Dalai Lama states: "From one viewpoint, Buddhism is a religion, from another viewpoint Buddhism is a science of mind and not a religion. Buddhism can be a bridge between these two sides. Therefore, with this conviction I try to have closer ties with scientists, mainly in the fields of cosmology, psychology, neurobiology and physics. In these fields there are insights to share, and to a certain extent we can work together." Ilkka Pyysiäinen states: "There are thus great difficulties involved in conceptualizing religion as belief in god(s), superhuman agents, etc., although we intuitively think that some such beings, nevertheless, are essential in religion. As is well-known, Buddhism is the favorite example of scholars who have argued that we should find some other way of defining religion than the one based on the idea of belief in gods or superhuman beings." and "Buddhism does not have to be the problematic touchstone for a global concept of religion." Martin Southwold states: "It is argued that Buddhism, though non-theistic, resembles other religions in depending on mystical notions; it is shown how this contributes to understanding the social functions of religions." Walpola Rahula states: "The question has often been asked: Is Buddhism a religion or a philosophy? It does not matter what you call it. Buddhism remains what it is whatever label you may put on it. The label is immaterial. Even the label 'Buddhism' which we give to the teaching of the Buddha is of little importance. The name one gives it is inessential. What's in a name? That which we call a rose, By any other name would smell as sweet. In the same way Truth needs no label: it is neither Buddhist, Christian, Hindu nor Moslem. It is not the monopoly of anybody. Sectarian labels are a hindrance to the independent understanding of Truth, and they produce harmful prejudices in men's minds." Dzogchen Ponlop Rinpoche states: "If you are interested in 'meeting the Buddha' and following his example, then you should realize that the path the Buddha taught is primarily a study of your own mind and a system for training your mind. This path is spiritual, not religious. Its goal is self-knowledge, not salvation; freedom, not heaven. And it is deeply personal." Peter Harvey states: "The English term 'Buddhism' correctly indicates that the religion is characterized by devotion to 'the Buddha', 'Buddhas', or 'buddhahood'." Joseph Goldstein states: "Although there are many difference among the various religions of the world, and among the various schools of Buddhism itself, there is also a great deal in common..."
Buddhism provides many opportunities for comparative study with a diverse range of subjects. For example, Buddhism's emphasis on the Middle way not only provides a unique guideline for ethics but has also allowed Buddhism to peacefully coexist with various differing beliefs, customs and institutions in countries where it has resided throughout its history. Also, its moral and spiritual parallels with other systems of thought—for example, with various tenets of Christianity—have been subjects of close study. In addition, the Buddhist concept of dependent origination has been compared to modern scientific thought, as well as Western metaphysics. Scholar Isabelle Onians asserts that although "the Mahāyāna ... very occasionally referred contemptuously to earlier Buddhism as the Hinayāna, the Inferior Way," "the preponderance of this name in the secondary literature is far out of proportion to occurrences in the Indian texts." She notes that the term Śrāvakayāna was "the more politically correct and much more usual" term used by Mahāyānists. Jonathan Silk has argued that the term "Hinayana" was used to refer to whomever one wanted to criticize on any given occasion, and did not refer to any definite grouping of Buddhists. Only the Theravada school does not include the Mahayana scriptures in its canon. As the modern Theravada school is descended from a branch of Buddhism that diverged and established itself in Sri Lanka prior to the emergence of the Mahayana texts, debate exists as to whether the Theravada were historically included in the hinayana designation; in the modern era, this label is seen as derogatory, and is generally avoided. Generally, scholars conclude that the Mahayana scriptures were composed from the 1st century CE onwards: "Large numbers of Mahayana sutras were being composed in the period between the beginning of the common era and the fifth century", five centuries after the historical Gautama Buddha. Some of these had their roots in other scriptures composed in the 1st century BCE. It was not until after the 5th century CE that the Mahayana sutras started to influence the behavior of mainstream Buddhists in India: "But outside of texts, at least in India, at exactly the same period, very different—in fact seemingly older—ideas and aspirations appear to be motivating actual behavior, and old and established Hinnayana groups appear to be the only ones that are patronized and supported." These texts were apparently not universally accepted among Indian Buddhists when they appeared; the pejorative label hinayana was applied by Mahayana supporters to those who rejected the Mahayana sutras. Approximately six hundred Mahayana sutras have survived in Sanskrit or in Chinese or Tibetan translations. In addition, East Asian Buddhism recognizes some sutras regarded by scholars as of Chinese rather than Indian origin. Some of our sources maintain the authenticity of certain other texts not found in the canons of these schools (the early schools). These texts are those held genuine by the later school, not one of the eighteen, which arrogated to itself the title of Mahayana, 'Great Vehicle'. According to the Mahayana historians these texts were admittedly unknown to the early schools of Buddhists. However, they had all been promulgated by the Buddha. [The Buddha's] followers on earth, the sravakas ('pupils'), had not been sufficiently advanced to understand them, and hence were not given them to remember, but they were taught to various supernatural beings and then preserved in such places as the Dragon World. The Mahayana sutras often claim to articulate the Buddha's deeper, more advanced doctrines, reserved for those who follow the bodhisattva path. That path is explained as being built upon the motivation to liberate all living beings from unhappiness. Hence the name Mahāyāna (lit., the Great Vehicle). The Mahayana sutras are a very broad genre of Buddhist scriptures that the Mahayana Buddhist tradition holds are original teachings of the Buddha. 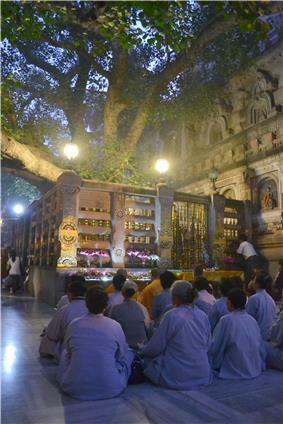 Some adherents of Mahayana accept both the early teachings (including in this the Sarvastivada Abhidharma, which was criticized by Nagarjuna and is in fact opposed to early Buddhist thought) and the Mahayana sutras as authentic teachings of Gautama Buddha, and claim they were designed for different types of persons and different levels of spiritual understanding. The Tripiṭaka Koreana in South Korea, an edition of the Chinese Buddhist canon carved and preserved in over 81,000 wood printing blocks. Much of the material in the Canon is not specifically "Theravadin", but is instead the collection of teachings that this school preserved from the early, non-sectarian body of teachings. According to Peter Harvey, it contains material at odds with later Theravadin orthodoxy. He states: "The Theravadins, then, may have added texts to the Canon for some time, but they do not appear to have tampered with what they already had from an earlier period." According to the scriptures, soon after the death of the Buddha, the first Buddhist council was held; a monk named Mahākāśyapa (Pāli: Mahākassapa) presided. 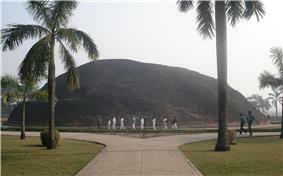 The goal of the council was to record the Buddha's teachings. Upāli recited the vinaya. Ānanda, the Buddha's personal attendant, was called upon to recite the dhamma. These became the basis of the Tripitaka. However, this record was initially transmitted orally in form of chanting, and was committed to text in the last century BCE. Both the sūtras and the vinaya of every Buddhist school contain a wide variety of elements including discourses on the Dharma, commentaries on other teachings, cosmological and cosmogonical texts, stories of the Gautama Buddha's previous lives, and various other subjects. The Pāli Tipitaka is the only early Tipitaka (Sanskrit: Tripiṭaka) to survive intact in its original language, but a number of early schools had their own recensions of the Tipitaka featuring much of the same material. We have portions of the Tipitakas of the Sārvāstivāda, Dharmaguptaka, Sammitya, Mahāsaṅghika, Kāśyapīya, and Mahīśāsaka schools, most of which survive in Chinese translation only. According to some sources, some early schools of Buddhism had five or seven pitakas. The Pāli Tipitaka, which means "three baskets", refers to the Vinaya Pitaka, the Sutta Pitaka, and the Abhidhamma Pitaka. The Vinaya Pitaka contains disciplinary rules for the Buddhist monks and nuns, as well as explanations of why and how these rules were instituted, supporting material, and doctrinal clarification. The Sutta Pitaka contains discourses ascribed to Gautama Buddha. The Abhidhamma Pitaka contains material often described as systematic expositions of the Gautama Buddha's teachings. Dwight Goddard collected a sample of Buddhist scriptures, with the emphasis on Zen, along with other classics of Eastern philosophy, such as the Tao Te Ching, into his 'Buddhist Bible' in the 1920s. More recently, Dr. Babasaheb Ambedkar attempted to create a single, combined document of Buddhist principles in "The Buddha and His Dhamma". Other such efforts have persisted to present day, but currently there is no single text that represents all Buddhist traditions. Over the years, various attempts have been made to synthesize a single Buddhist text that can encompass all of the major principles of Buddhism. In the Theravada tradition, condensed 'study texts' were created that combined popular or influential scriptures into single volumes that could be studied by novice monks. Later in Sri Lanka, the Dhammapada was championed as a unifying scripture. The followers of Theravāda Buddhism take the scriptures known as the Pāli Canon as definitive and authoritative, while the followers of Mahāyāna Buddhism base their faith and philosophy primarily on the Mahāyāna sūtras and their own vinaya. The Pāli sutras, along with other, closely related scriptures, are known to the other schools as the āgamas. Unlike many religions, Buddhism has no single central text that is universally referred to by all traditions. However, some scholars have referred to the Vinaya Pitaka and the first four Nikayas of the Sutta Pitaka as the common core of all Buddhist traditions. This could be considered misleading, as Mahāyāna considers these merely a preliminary, and not a core, teaching. The Tibetan Buddhists have not even translated most of the āgamas (though theoretically they recognize them) and they play no part in the religious life of either clergy or laity in China and Japan. Other scholars say there is no universally accepted common core. The size and complexity of the Buddhist canons have been seen by some (including Buddhist social reformer Babasaheb Ambedkar) as presenting barriers to the wider understanding of Buddhist philosophy. Buddhist scriptures and other texts exist in great variety. Different schools of Buddhism place varying levels of value on learning the various texts. Some schools venerate certain texts as religious objects in themselves, while others take a more scholastic approach. Buddhist scriptures are mainly written in Pāli, Tibetan, Mongolian, and Chinese. Some texts still exist in Sanskrit and Buddhist Hybrid Sanskrit. 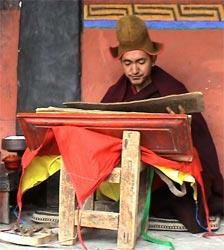 Buddhist monk Geshe Konchog Wangdu reads Mahayana sutras from an old woodblock copy of the Tibetan Kanjur. Vajrayana combined and developed a variety of elements, a number of which had already existed for centuries. In addition to the Mahāyāna scriptures, Vajrayāna Buddhists recognise a large body of Buddhist Tantras, some of which are also included in Chinese and Japanese collections of Buddhist literature, and versions of a few even in the Pali Canon. In one of the first major contemporary academic treatises on the subject, Fairfield University professor Ronald M. Davidson argues that the rise of Vajrayana was in part a reaction to the changing political climate in India at the time. With the fall of the Gupta dynasty, in an increasingly fractious political environment, institutional Buddhism had difficulty attracting patronage, and the folk movement led by siddhas became more prominent. After perhaps two hundred years, it had begun to get integrated into the monastic establishment. There are differing views as to just when Vajrayāna and its tantric practice started. In the Tibetan tradition, it is claimed that the historical Śākyamuni Buddha taught tantra, but as these are esoteric teachings, they were passed on orally first and only written down long after the Buddha's other teachings. Nālandā University became a center for the development of Vajrayāna theory and continued as the source of leading-edge Vajrayāna practices up through the 11th century. These practices, scriptures and theories were transmitted to China, Tibet, Indochina and Southeast Asia. China generally received Indian transmission up to the 11th century including tantric practice, while a vast amount of what is considered Tibetan Buddhism (Vajrayāna) stems from the late (9th–12th century) Nālandā tradition. The Vajrayana tradition of Buddhism spread to China, Mongolia, and Tibet. In Tibet, Vajrayana has always been a main component of Tibetan Buddhism, while in China it formed a separate sect. 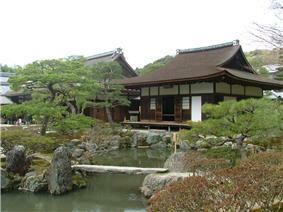 However, Vajrayana Buddhism became extinct in China but survived in elements of Japan's Shingon and Tendai sects. Native Mahayana Buddhism is practiced today in China, Japan, Korea, Singapore, parts of Russia and most of Vietnam (also commonly referred to as "Eastern Buddhism"). The Buddhism practiced in Tibet, the Himalayan regions, and Mongolia is also Mahayana in origin, but is discussed below under the heading of Vajrayana (also commonly referred to as "Northern Buddhism"). There are a variety of strands in Eastern Buddhism, of which "the Pure Land school of Mahayana is the most widely practised today.". In most of this area however, they are fused into a single unified form of Buddhism. In Japan in particular, they form separate denominations with the five major ones being: Nichiren, peculiar to Japan; Pure Land; Shingon, a form of Vajrayana; Tendai, and Zen. In Korea, nearly all Buddhists belong to the Chogye school, which is officially Son (Zen), but with substantial elements from other traditions. Mahayana schools recognize all or part of the Mahayana Sutras. Some of these sutras became for Mahayanists a manifestation of the Buddha himself, and faith in and veneration of those texts are stated in some sutras (e.g. the Lotus Sutra and the Mahaparinirvana Sutra) to lay the foundations for the later attainment of Buddhahood itself. 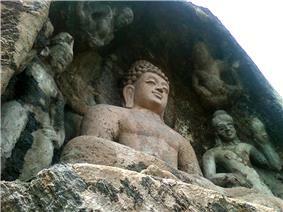 Mahayana Buddhism flourished in India from the 5th century CE onwards, during the dynasty of the Guptas. Mahāyāna centres of learning were established, the most important one being the Nālandā University in north-eastern India. Theravadin Buddhists think that personal effort is required to realize rebirth. Monks follow the vinaya: meditating, teaching and serving their lay communities. Laypersons can perform good actions, producing merit. Theravāda is primarily practiced today in Sri Lanka, Burma, Laos, Thailand, Cambodia as well as small portions of China, Vietnam, Malaysia and Bangladesh. It has a growing presence in the west. The Theravada school bases its practice and doctrine exclusively on the Pāli Canon and its commentaries. After being orally transmitted for a few centuries, its scriptures, the Pali Canon, were finally committed to writing in the 1st century BCE, in Sri Lanka, at what the Theravada usually reckon as the fourth council. 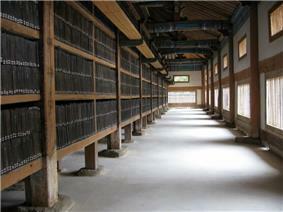 It is also one of the first Buddhist schools to commit the complete set of its canon into writing. The Sutta collections and Vinaya texts of the Pāli Canon (and the corresponding texts in other versions of the Tripitaka), are generally considered by modern scholars to be the earliest Buddhist literature, and they are accepted as authentic in every branch of Buddhism. 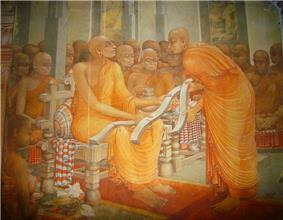 Theravada ("Doctrine of the Elders", or "Ancient Doctrine") is the oldest surviving Buddhist school. It is relatively conservative, and generally closest to early Buddhism. This school is derived from the Vibhajjavāda grouping that emerged amongst the older Sthavira group at the time of the Third Buddhist Council (c. 250 BCE). This school gradually declined on the Indian subcontinent, but its branch in Sri Lanka and South East Asia continues to survive. Both accept the Buddha as their teacher. Both accept the Middle way, dependent origination, the Four Noble Truths, the Noble Eightfold Path and the Three marks of existence. Both accept that members of the laity and of the sangha can pursue the path toward enlightenment (bodhi). Both consider buddhahood the highest attainment.